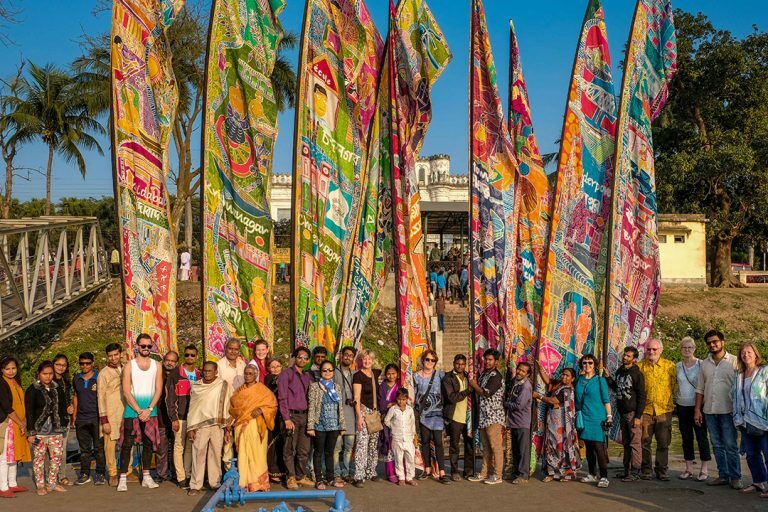 All the latest news from Kinetika: Recruitment call, how to buy Murshidabad Silk in the UK, new scrolls made for Neasden Temple and more! 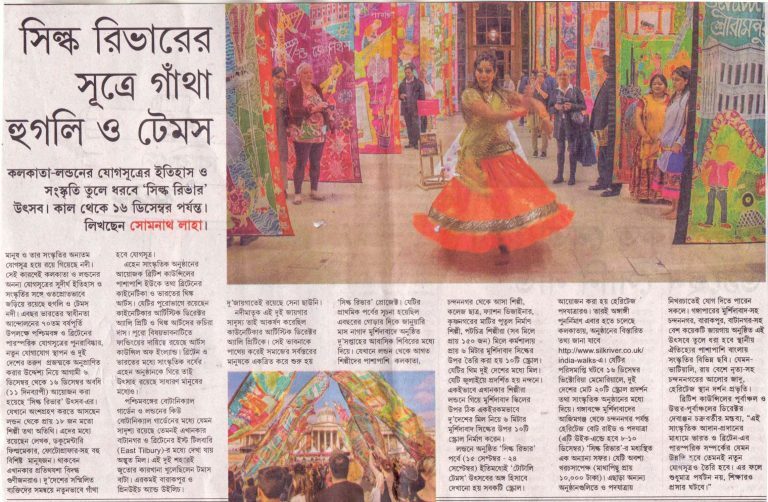 Murshidabad Silk, now available to buy in the UK from Kinetika! 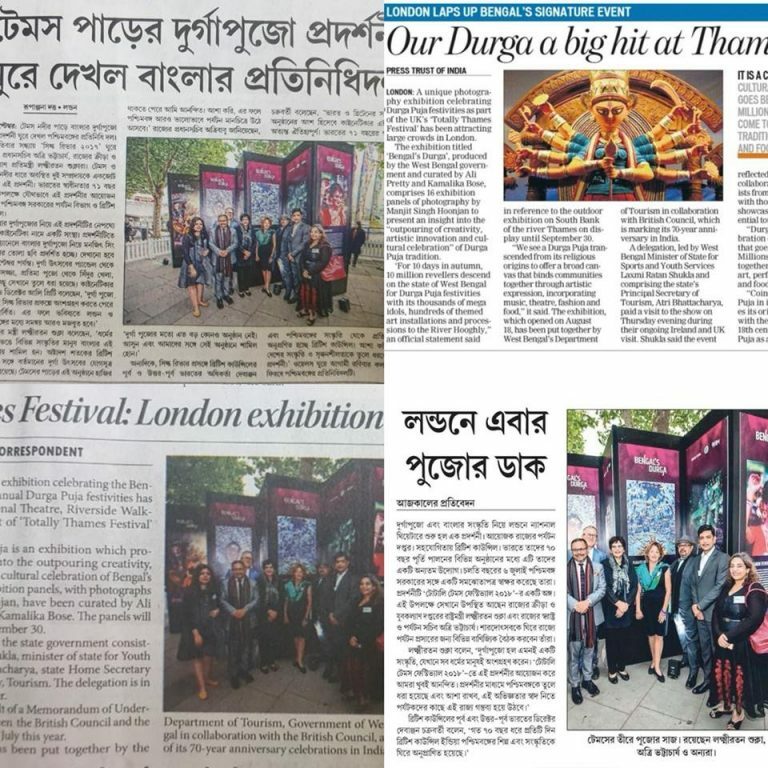 We're excited to report all these articles covered the Bengal's Durga exhibition on 7th Sept 2018. 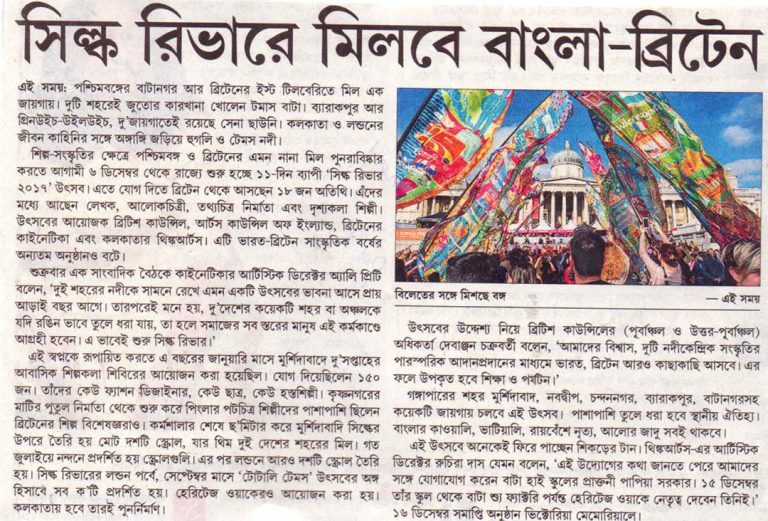 This article covering the Bengal's Durga exhibition at the Thames Festival, appeared in the newspaper Anandabazar Patrika on 3rd Sept 2018, on page 4. 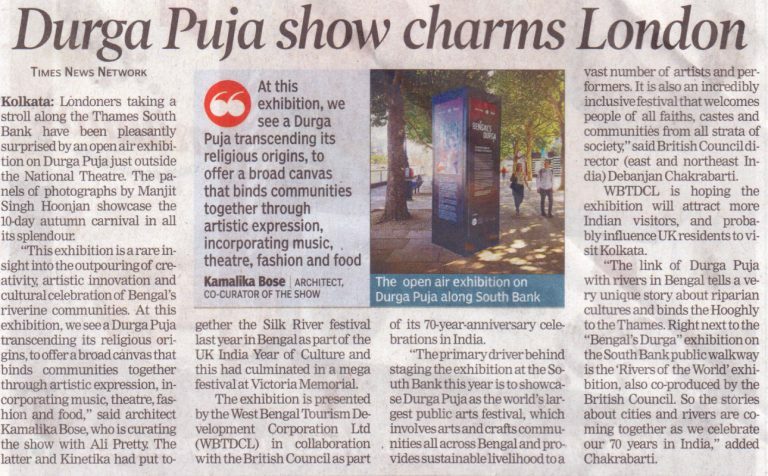 This article covering the Bengal's Durga exhibition at the Thames Festival, appeared in the Times of India. 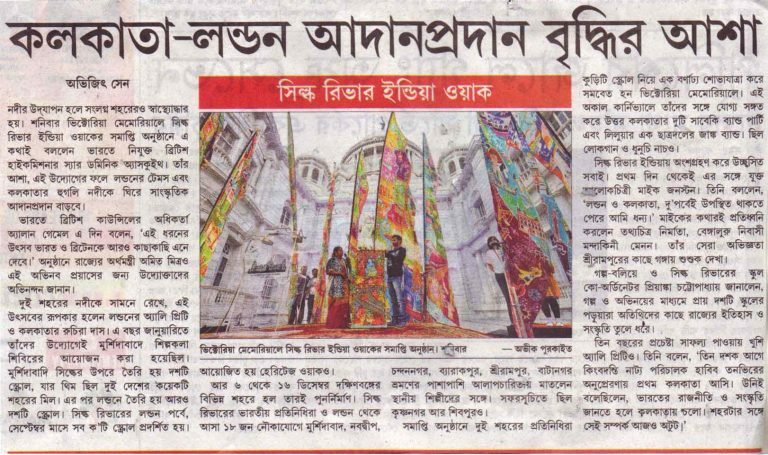 This article covering the Bengal's Durga exhibition appeared in the newspaper Anandabazar Patrika on 2nd Sept 2018. 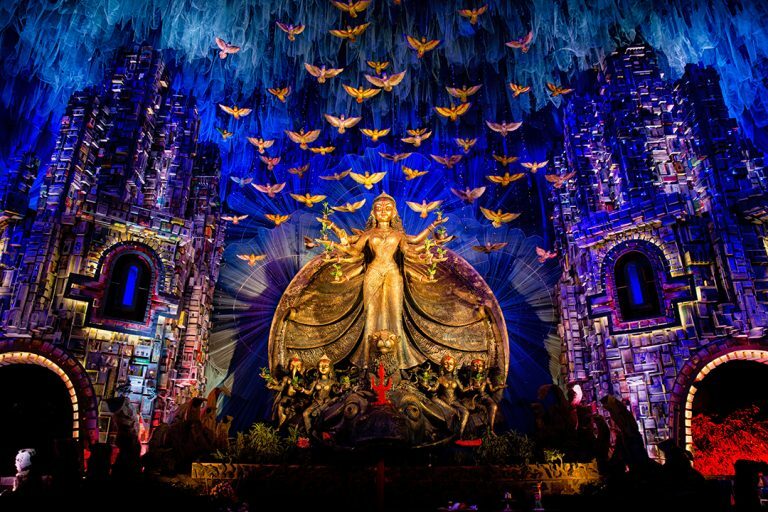 Bengal’s Durga was an exhibition of photographs from the Durga Puja Festival of West Bengal India. 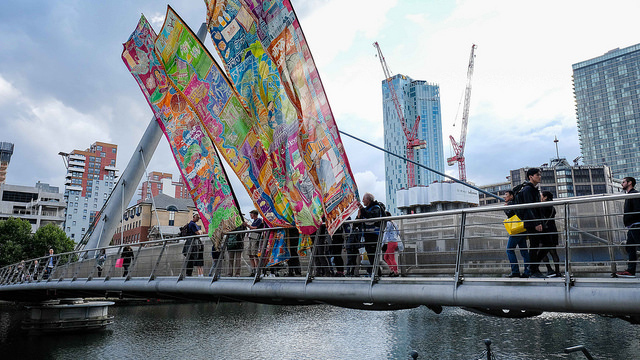 Kinetika were delighted that all 20 of the 6m hand painted flags made for Silk River took part in the Manchester Day Parade Sunday 17th June 2018. 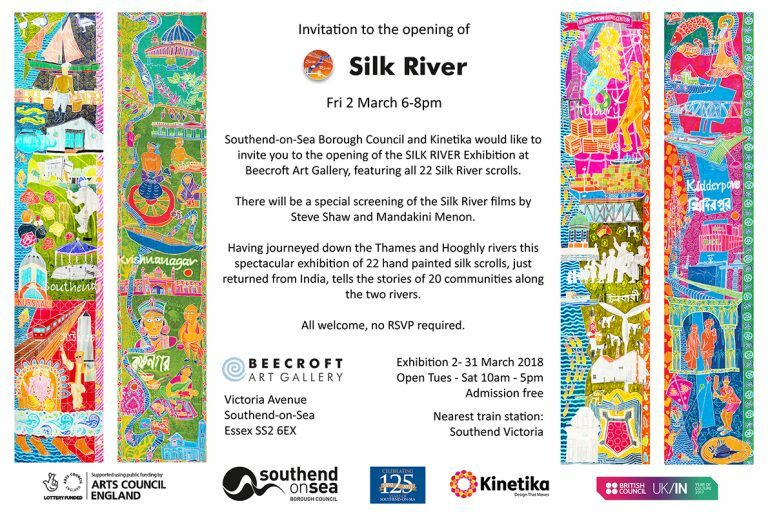 Having journeyed down the Thames and Hooghly rivers, the beautiful hand painted Silk River scrolls will now be exhibited at the Beecroft Gallery in Southend-on-Sea 2 March - 25 April 2018. 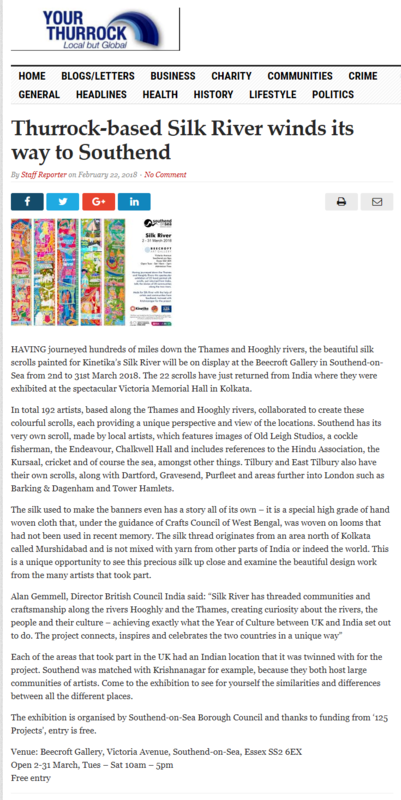 Here's the latest Kinetika and Silk River news, hot of the press! *Update* Due to adverse weather, the official opening of the Silk River exhibition has been delayed until Tues 6th March 6-8pm. 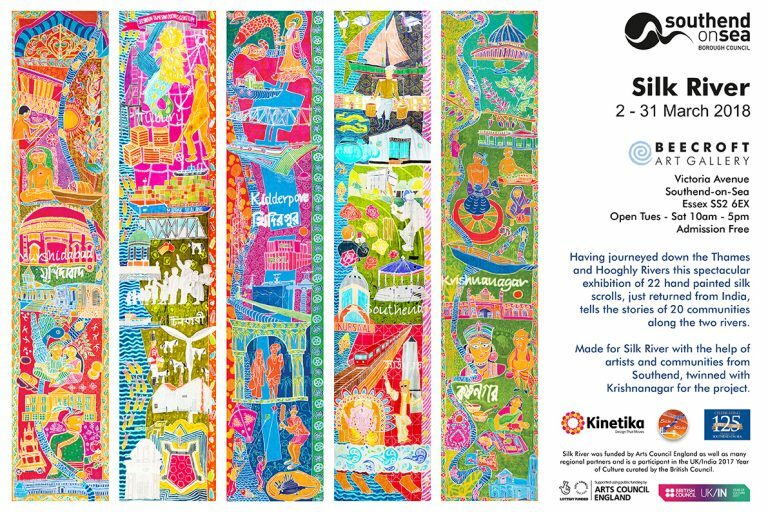 Having journeyed hundreds of miles down the Thames and Hooghly rivers, the beautiful silk scrolls will be on display in Southend-on-Sea 2 March - 25 April 2018. 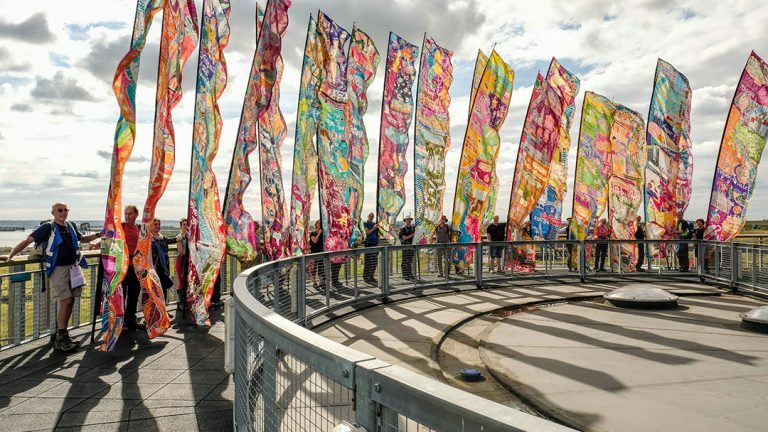 Having journeyed hundreds of miles down the Thames and Hooghly rivers, the beautiful silk scrolls will be on display in Southend-on-Sea from 2nd to 31st March 2018. Silk River has been an epic undertaking and we're looking forward to the many legacy projects that are beginning to take shape. Here is the end of project report, which contains an outline of some of the exciting things that happened and the impact of the project. 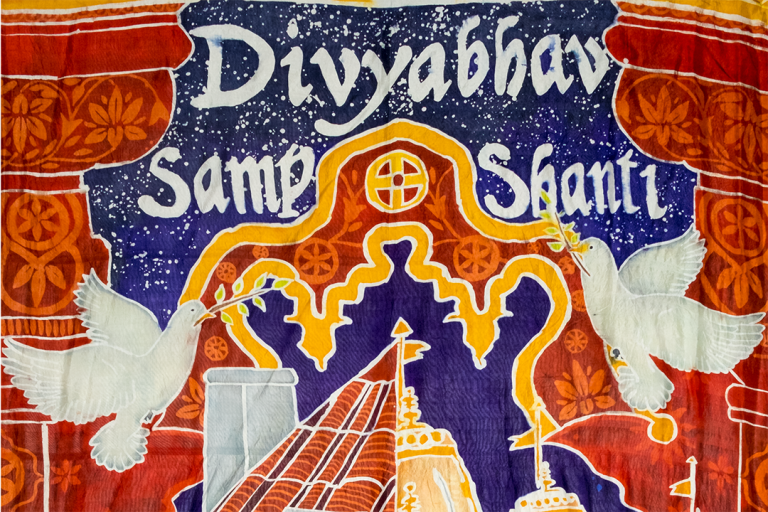 Bath Spa University celebrates end of Silk River programme of cultural exchange. 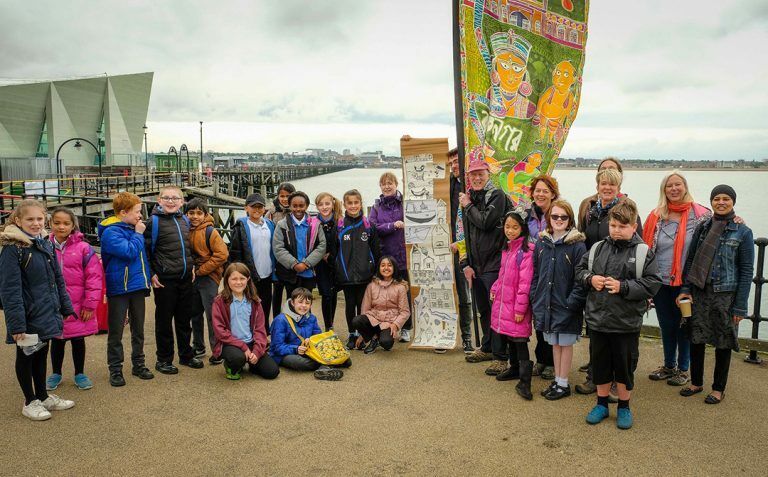 Borough's links at finale of project to share connection. 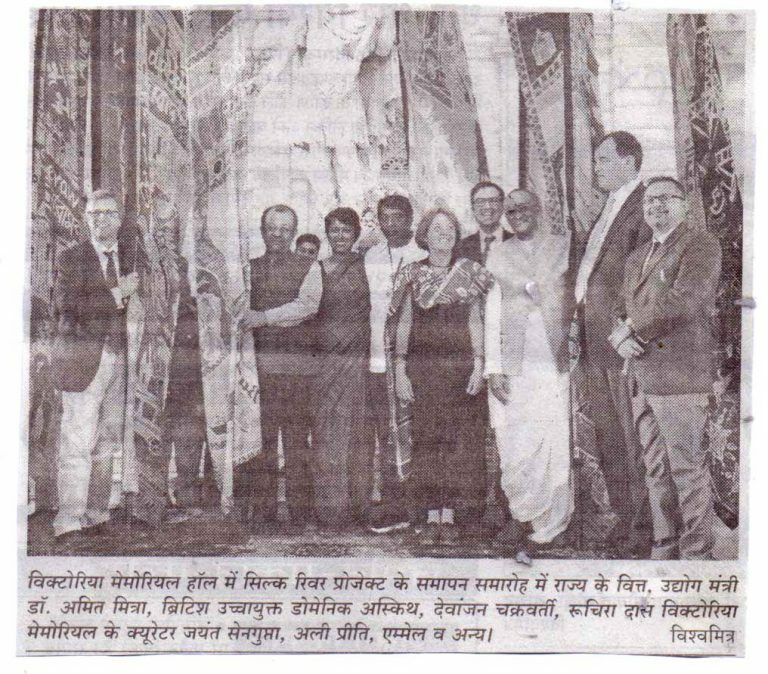 This article marked the finale of the Silk River project in India. 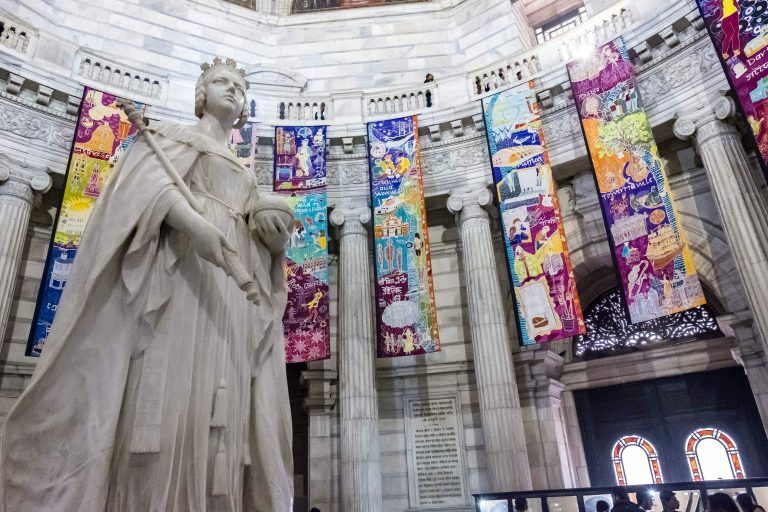 Open now from the 19th to 31st December, all 20 of the Silk River scrolls will be on display in the spectacular Central Hall at the Victoria Memorial in Kolkata. 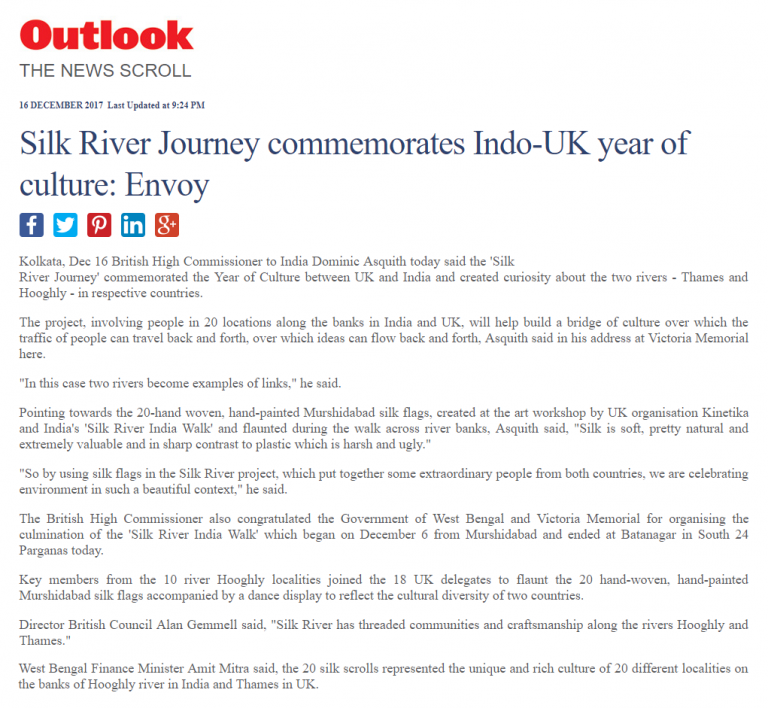 This article was published on 18th December 2017 on page 3, on the occasion of the Silk River Closing Ceremony. British Envoy draws attention to plastic pollution in oceans. 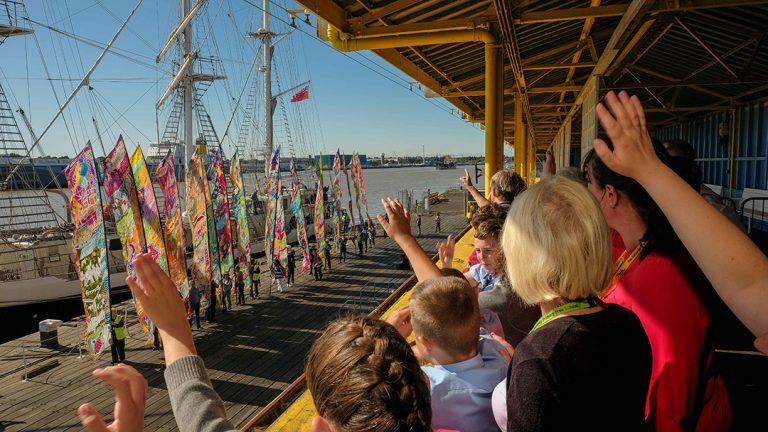 This article reports on the speech made by Sir Dominic Asquith at the Silk River Closing Ceremony. 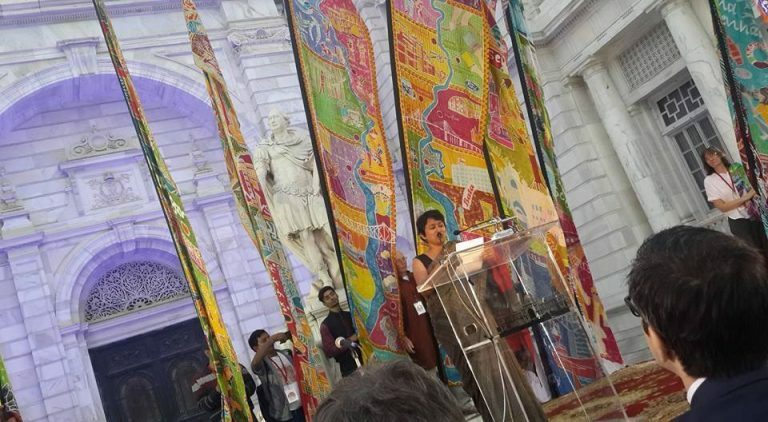 Ruchira Das delivered the Vote of Thanks at the Silk River Closing Ceremony on Sat 16th Dec. Here is the transcript for all those not able to be present. Silk River Closing Ceremony. 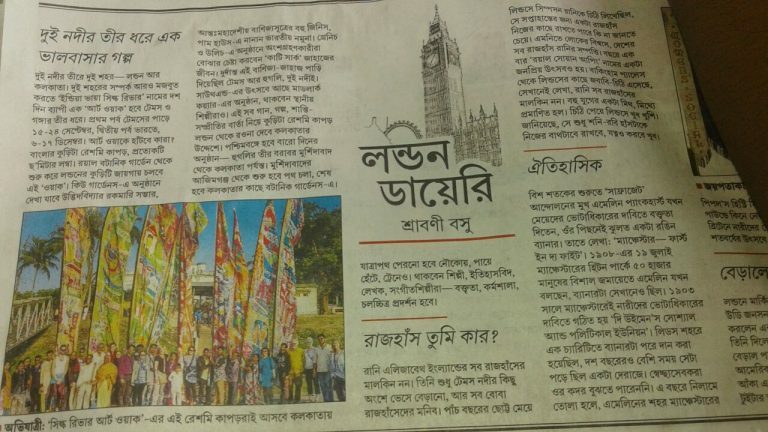 Ei Samay is a Bengali-language broadsheet daily newspaper who reported on the Silk River Closing Ceremony with this article. 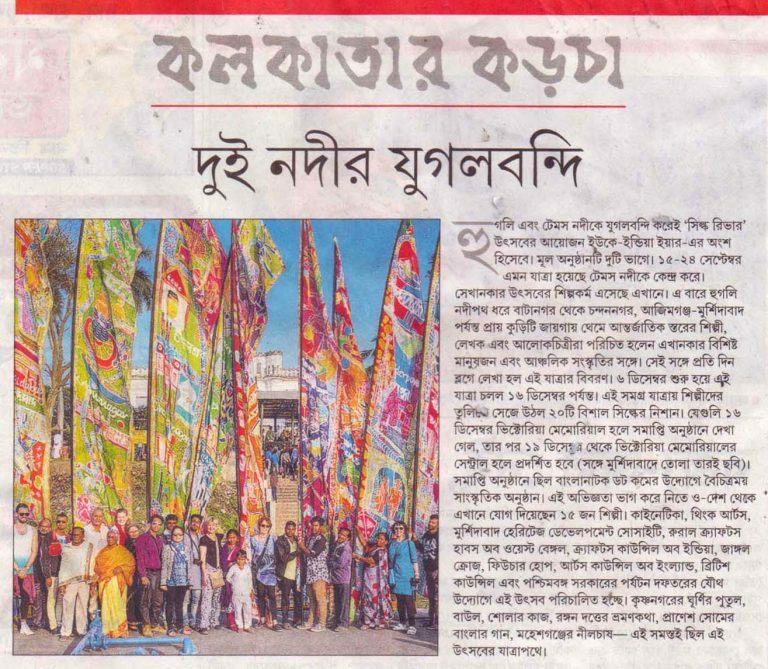 This great photo of the Silk River Closing Ceremony appeared in India's oldest Hindi daily newspaper, Dainik Vishwamitra on 17th December 2017 on page 4. 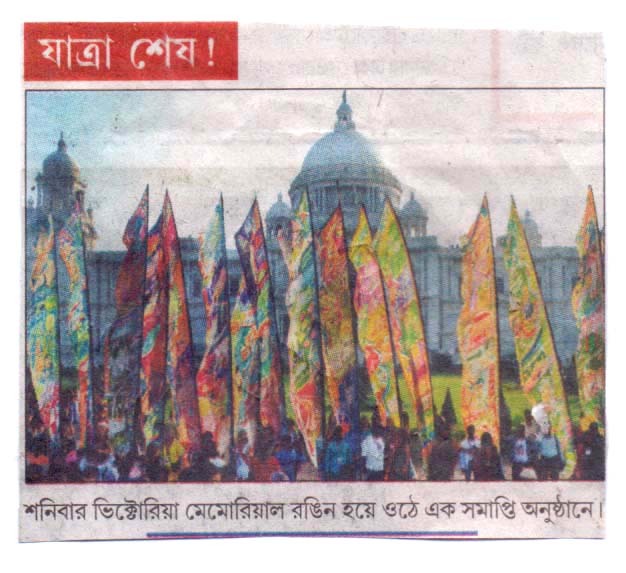 This wonderful picture of the Silk River Closing Ceremony appeared in Anandabazar Patrika which is an Indian Bengali language daily newspaper published in Kolkata. Prabhat Khabar is a Hindi language newspaper published daily in Jharkhand, Bihar and West Bengal. 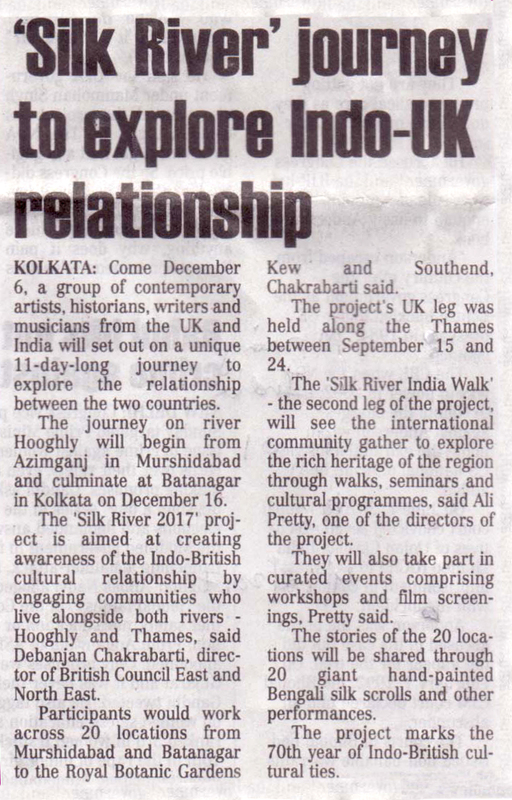 This article shows the British High Commissioner Sir Dominic Asquith attending the Silk River closing ceremony on 16th Dec. Silk River Closing Ceremony. 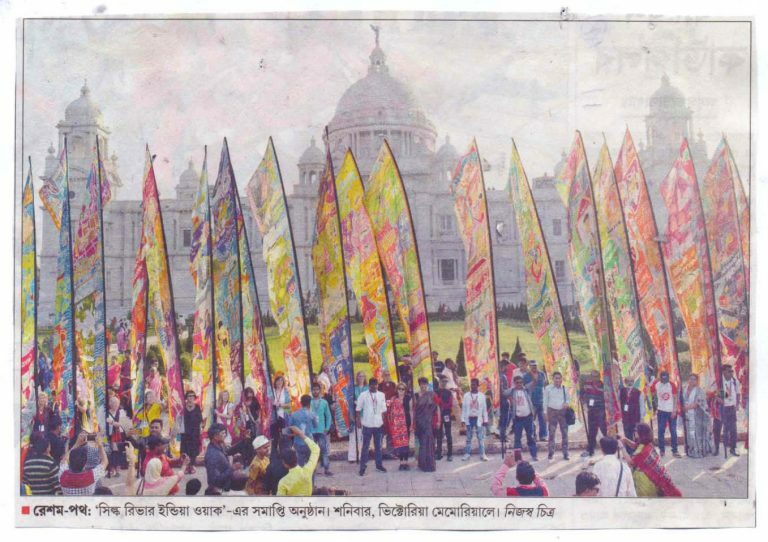 This image appeared in the Khabar 365 newspaper on 17th-December on page 4, reporting on the Silk River Closing Ceremony which happened the day before. Bengal, England Tied by Rivers. 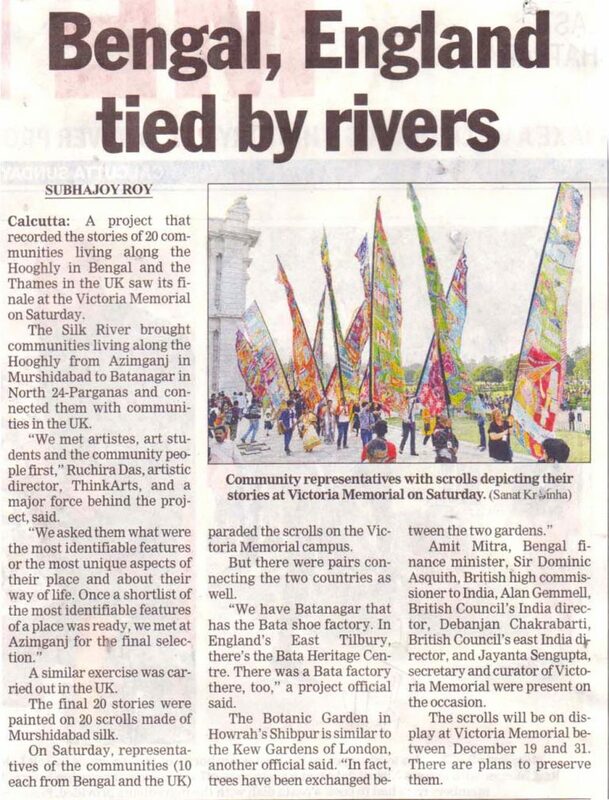 Calcutta: A project that recorded the stories of 20 communities living along the Hooghly in Bengal and the Thames in the UK saw its finale at the Victoria Memorial on Saturday. Bengal reviving Muslin industry, says Amit Mitra, West Bengal Finance and Industries Minister, addressing the culmination of the Silk River project. 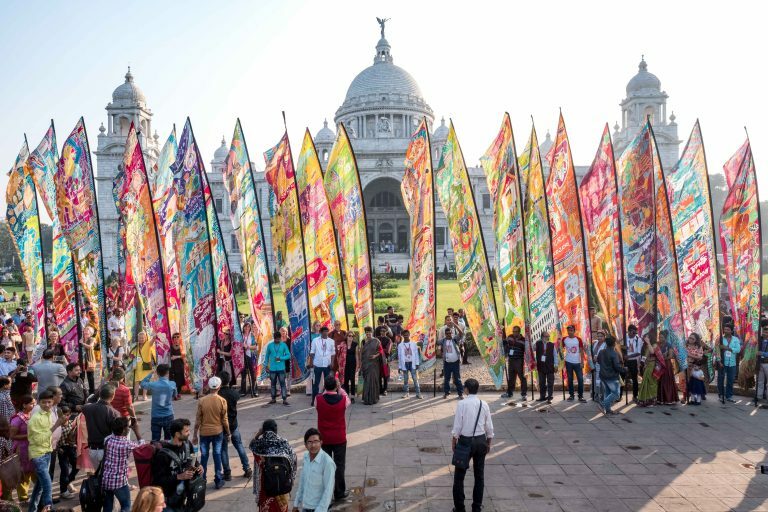 After four weeks of travel and years of planning, the Silk River has reached the end of its journey with the closing ceremony today at Kolkata’s Victoria Memorial. 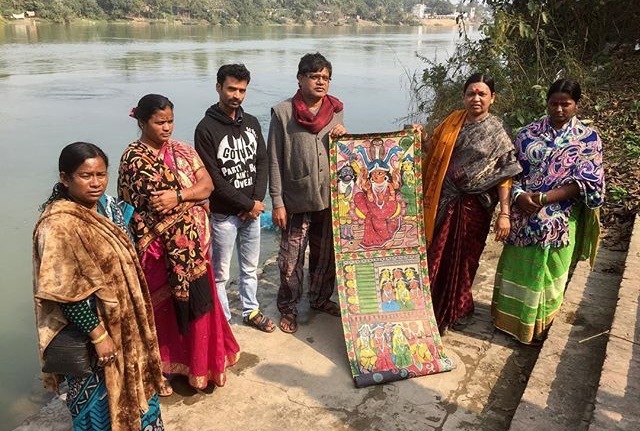 You would think the Kidderpore tour was enough for one day, but our Silk River journey included one more wonderful and interesting visit, to Batanagar. 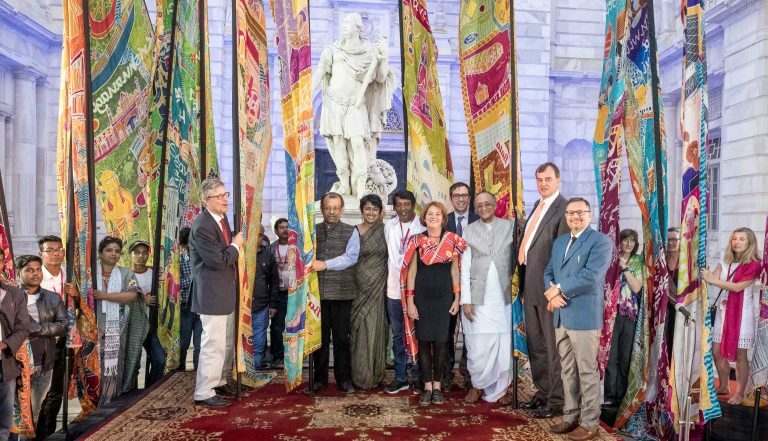 Kolkata Dec 16th British High Commissioner to India Dominic Asquith today said the 'Silk River Journey' commemorated the Year of Culture between UK and India and created curiosity about the two rivers. There is something going on with the geography of Calcutta that I don’t understand. It ought to be simple. Ask any British person where in the world they would like to go, at least once in their life, and I’ll bet that a visit to India would be at the top of the list. And if there was one experience that such potential visitors would specify, it would be a journey on Indian railways. 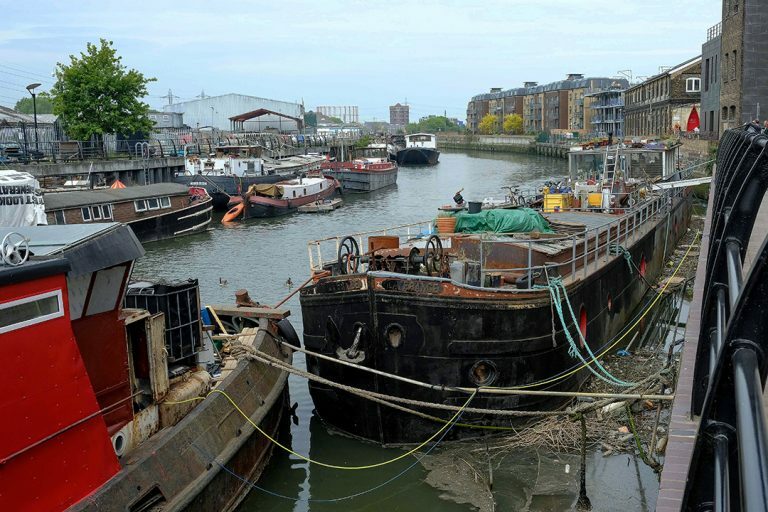 "Jalangi meets Thames in a cultural exchange." Jalangi is the name given to the local river. It’s our last day on the river today. We leave at seven in a fast-running tide that’s carrying rafts of water hyacinth along, some of them inhabited by pond herons. After breakfast we take a bus through Barrackpore and get down near the river a few kilometres upstream from where we are staying. Then we walk down a small lane with walls on both sides. 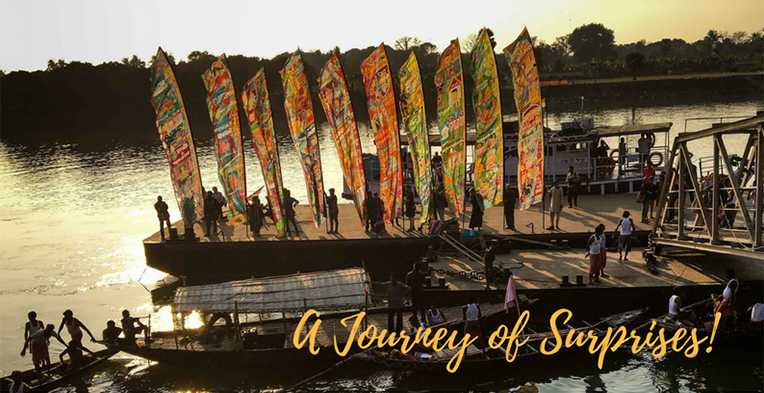 Photos – Silk River India so far! 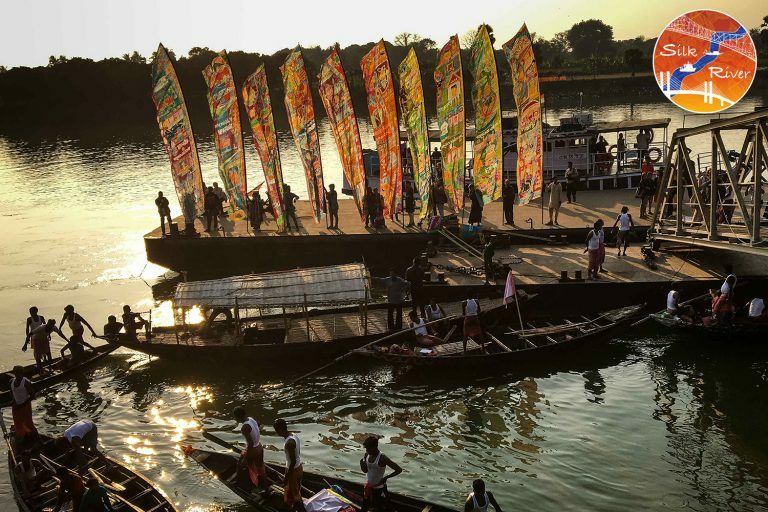 The photos from the Silk River journey so far by Mike Johnston. Dawn eases the world into view from the boat. 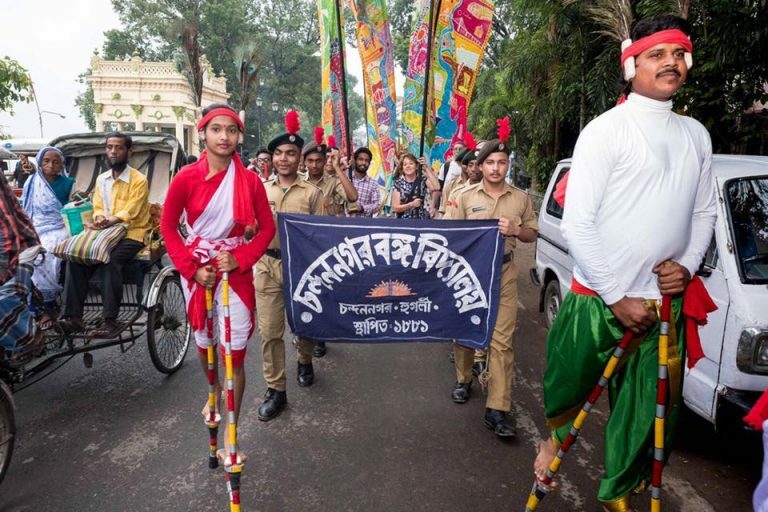 We are anchored off Chandannagar where today there will be a parade. It’s the best yet. We walk down The Strand with drummers and a team of acrobats on stilts wearing peacock feather headdresses. 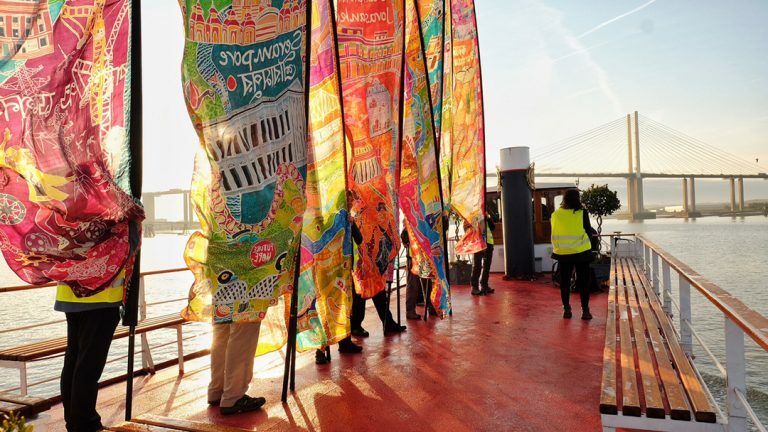 Walk To Rebuild Cultural Bond Between Hooghly And Thames. 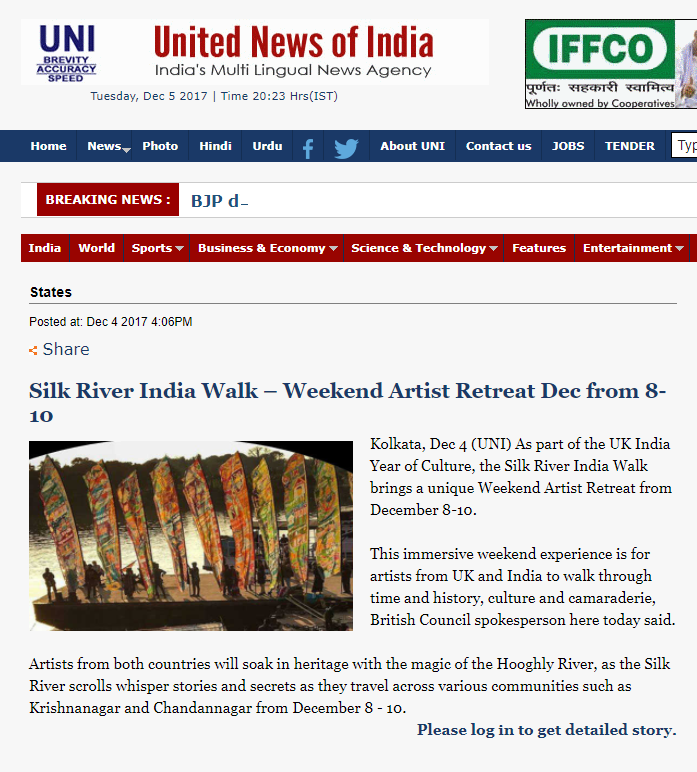 The news coverage of the Silk River walk keeps coming! 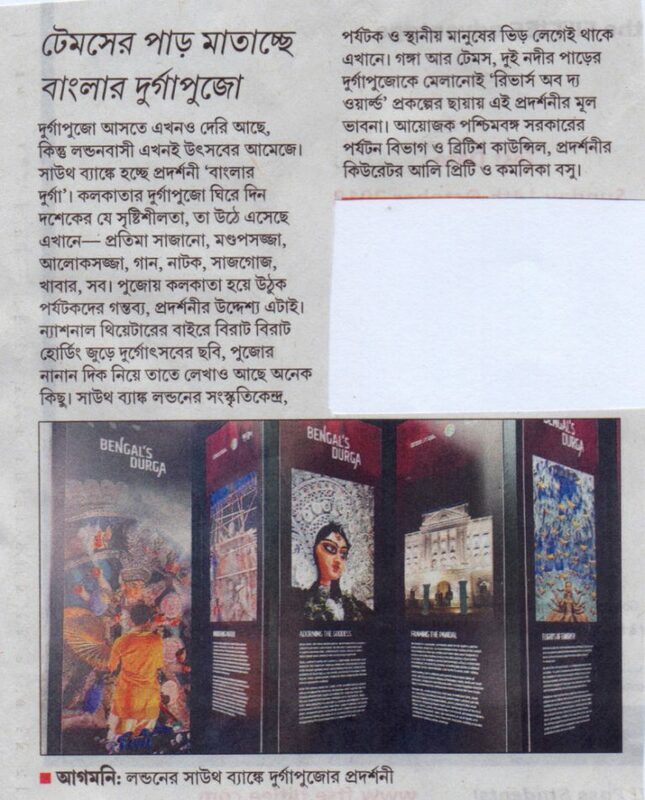 This article appeared on the News from Nadia website on 9th December. During the night, when we are chugging downriver from Krishnanagar, there is torrential rain. Visibility at dawn is not much better. It’s what the Scots call dreich: thicker than mist, but not quite rain. In the wheelhouse, our pilot Nimai, is working hard to steer around the sandbanks, many of them invisible to ordinary mortals. But he sees them. I like a town with a speciality. 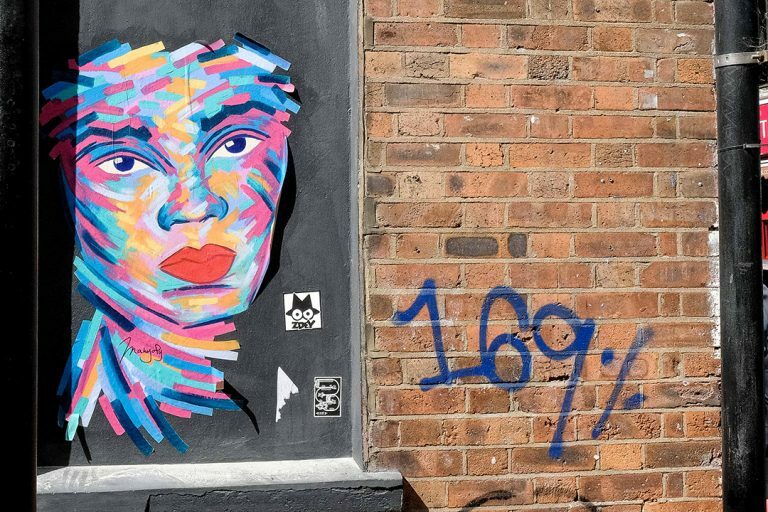 Nuremberg is wooden toys, York is chocolate, Buenas Aires is tango and London is second-rate politicians – no, hang on, every capital city seems to specialise in those. Just before dawn we are on the riverbank about to be ferried out to our boat which floats offshore in the pearly mist. The sky and the river are same shade of grey. For once the world is hushed and almost silent. One wonderful thing that happens when you travel through a landscape with something of a purpose is the chance encounters, the unexpected conversations that suddenly open up unseen worlds. Like with Darshan last night in Azimganj when he let slip about the elephant. 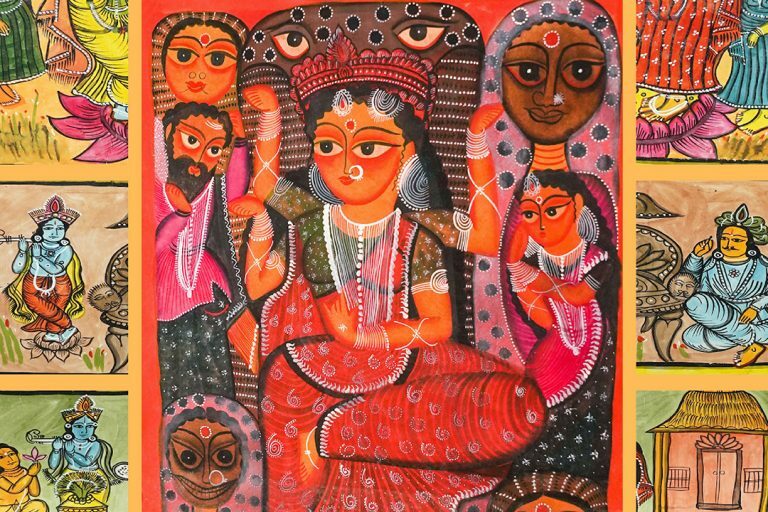 When I tell people in England that I’m going to India, they always seem to say something like: ‘You must love it.’ And after a pause: ‘When were you last there?’ Their implication, I reckon, is that India is changing fast and the India I knew may no longer be around. 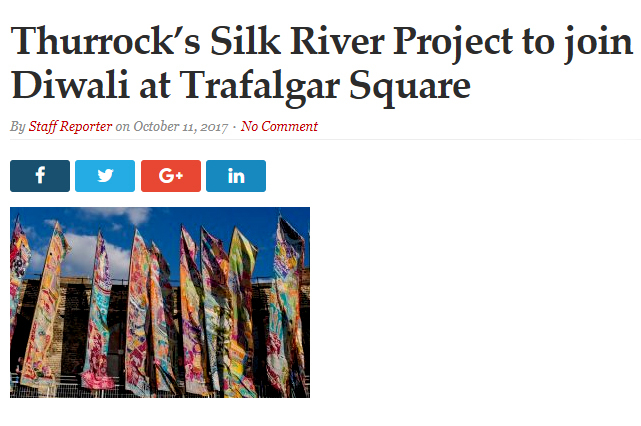 Before Ali Pretty went to India, she was interviewed by the Thames Festival Trust about the Silk River Project. A Celebration of Rivers. 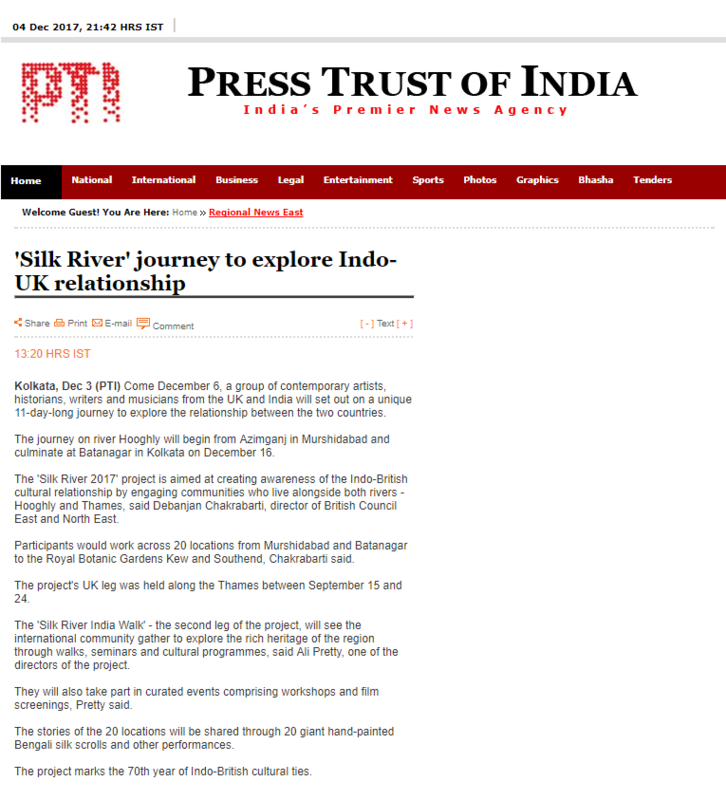 We're delighted that a wonderful article has been published about Silk River in the Telegraph (India) today. 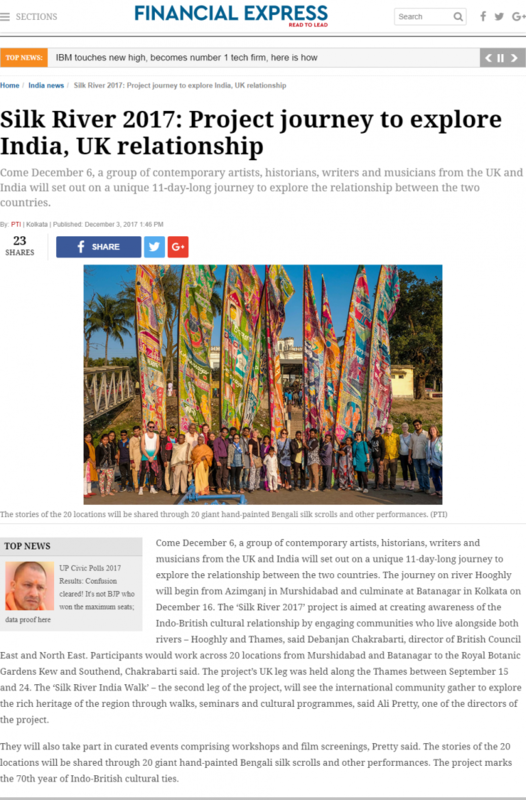 This article was written by Bruce Bucknell, the British deputy high commissioner in Kolkata. 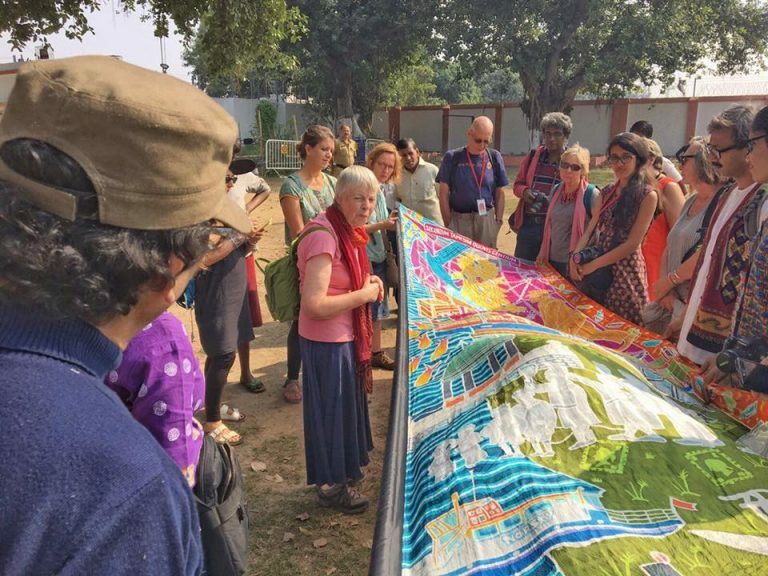 Silk River India walk starts today! 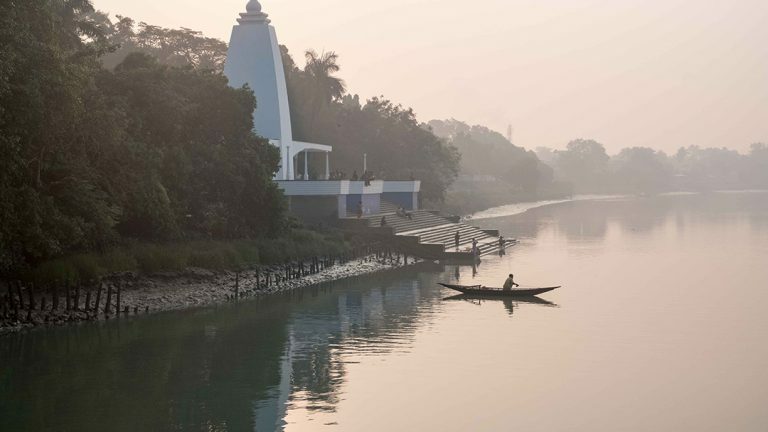 Today we begin our adventure down the Hooghly with Silk River India! 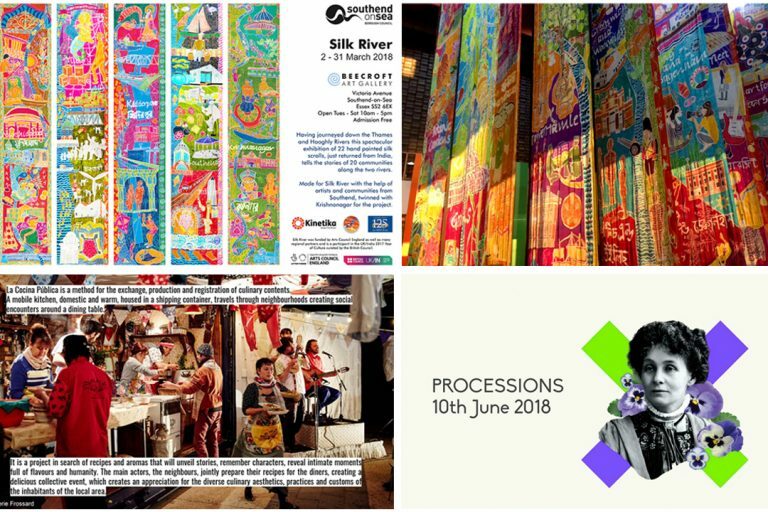 Silk River India starts tomorrow! Our bags are packed, we're ready to go! 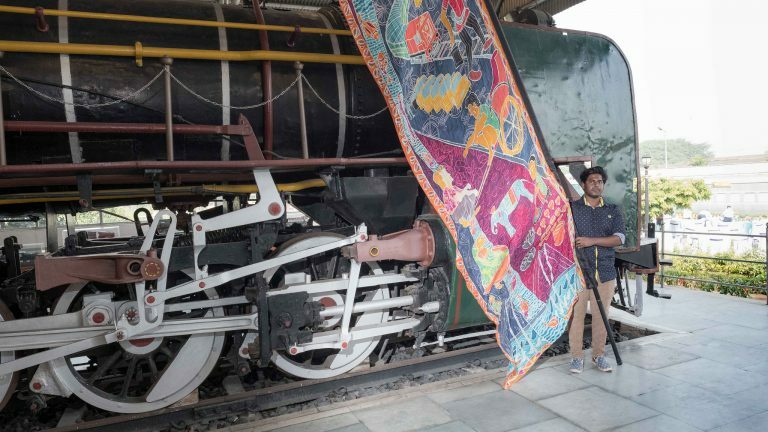 Silk River participants and team members from India & UK have boarded the Lalgola Express to Murshidabad, West Bengal and we're on our way! 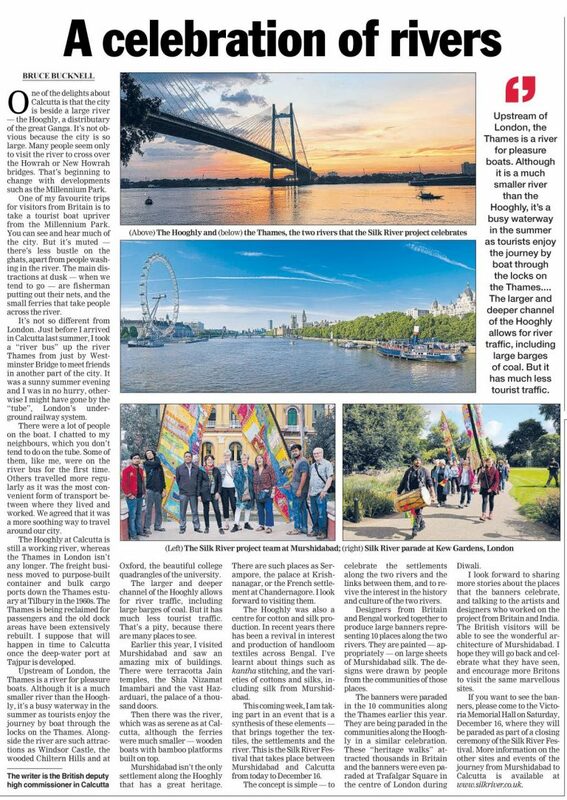 Silk River tour to boost Indo-UK ties - This article appeared on p1 of The Asian Age. 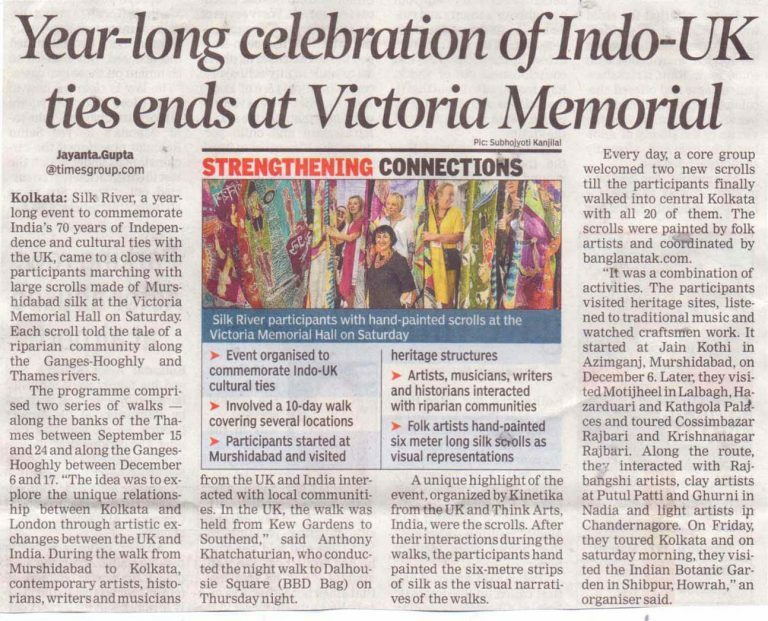 Press coverage – Indian walk starts in 2 days! 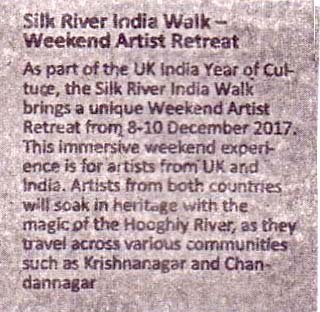 Silk River India walk 'Weekend Artist Retreat Dec 8-10th"
Silk River Journey To Depict The Relation Between India - Britain. This article appeared in the publication Salam Duniya on 4th Dec. 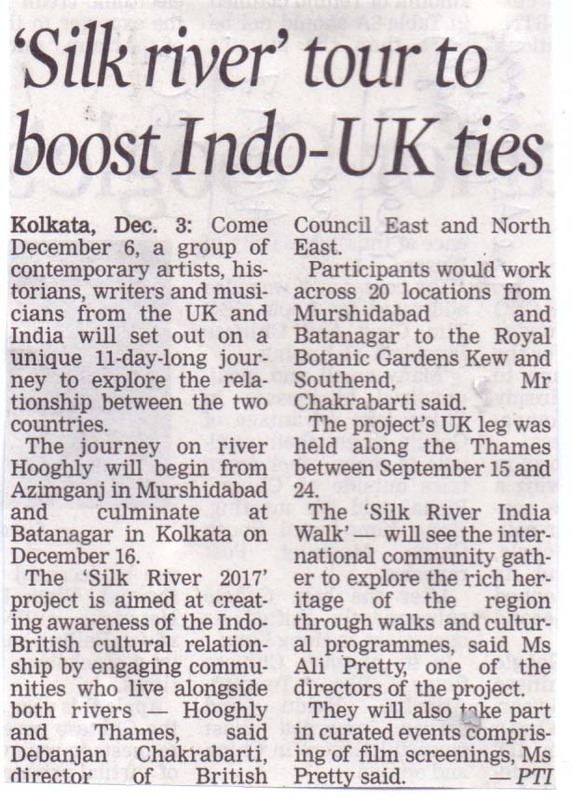 This article appeared in the The Political And Business Daily on 4th Dec, covering the launch of the Silk River India walks 6-16th Dec.
'Silk River' journey to explore Indo-UK relationship. This article appeared on the website of the Press Trust of India on 3rd December. 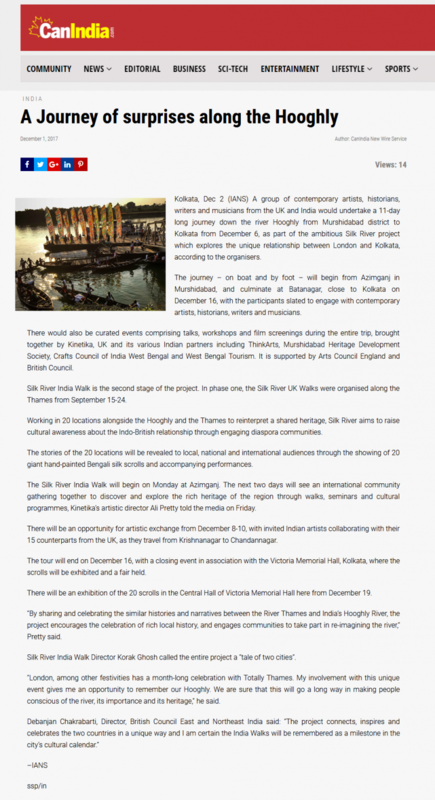 This article appeared on the Web India 123 website on 2nd Dec. 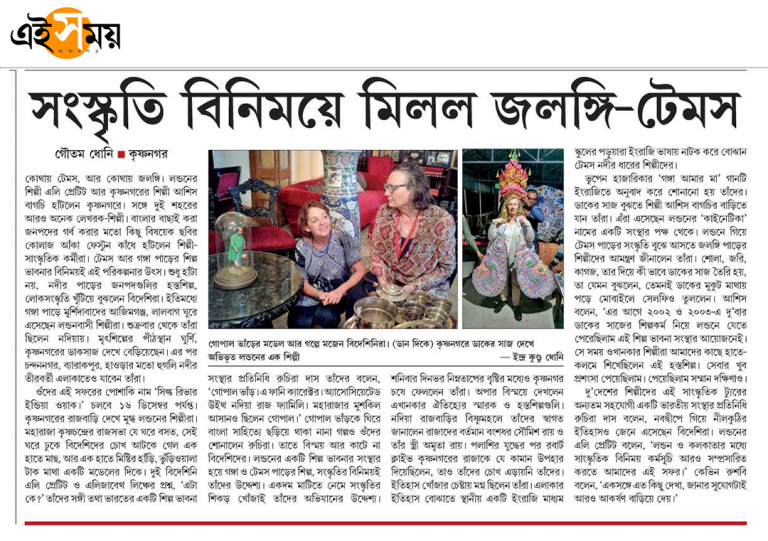 This article appeared in the Hindi paper Ei Samay on 2nd Dec 2017 in Kolkata, and it covers the launch of the Silk River Walk in India happening on 6-16th Dec.
A Journey of surprises along the Hooghly. 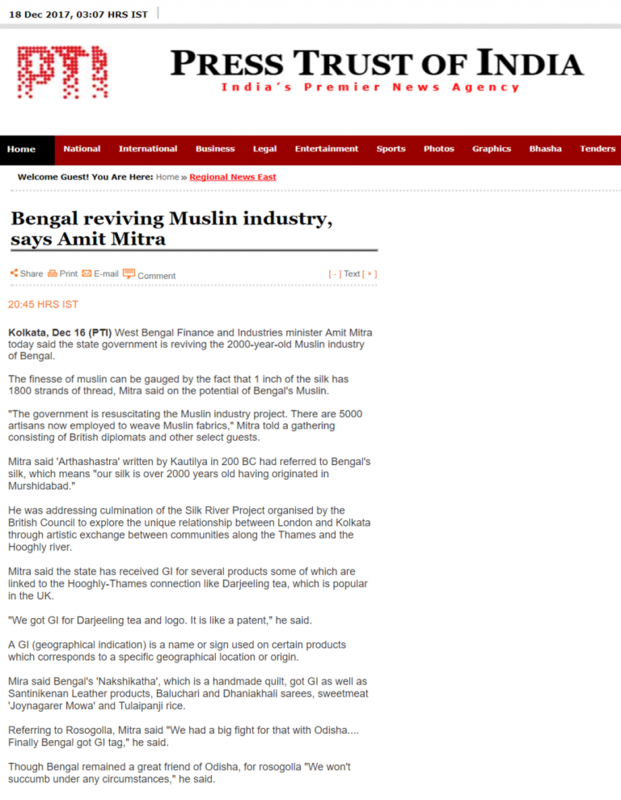 This article appeared on the CanIndia website on 1st Dec. 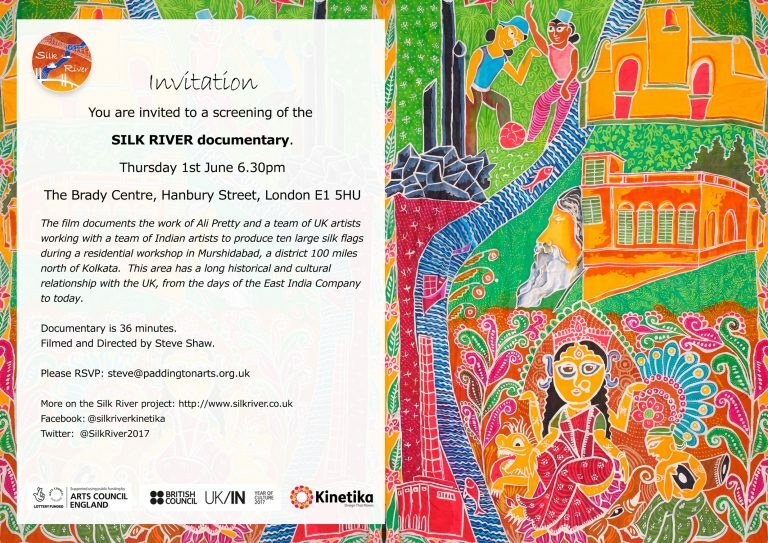 Here is a beautiful new film by Mandakini Menon who captured footage from the UK section of the Silk River walk. 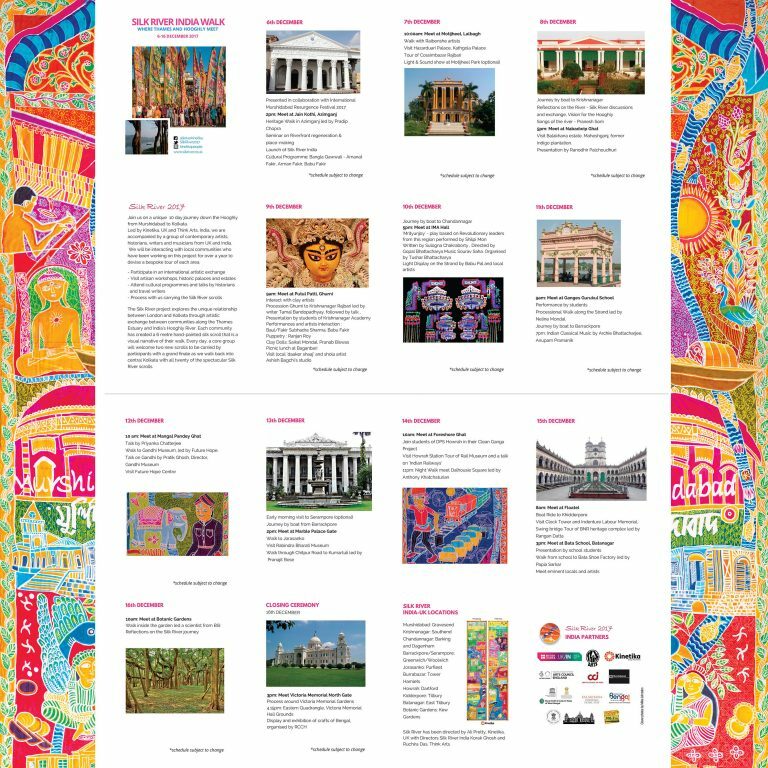 This will give you a small taste of what to expect on the Indian walk 6-16th Dec, truly a journey of surprises! Silk River India Press Launch Today! 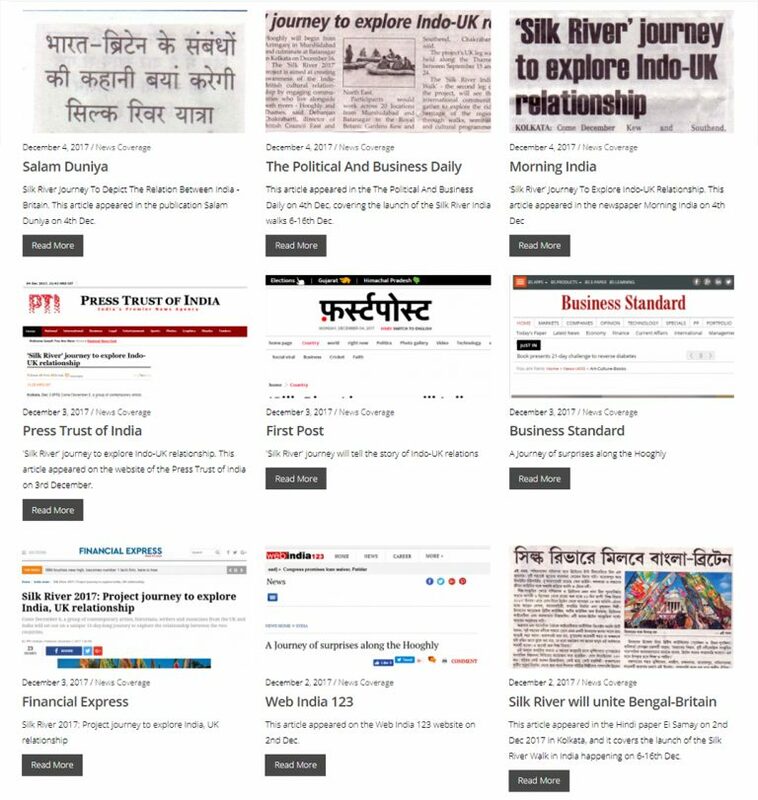 Silk River India Launches! 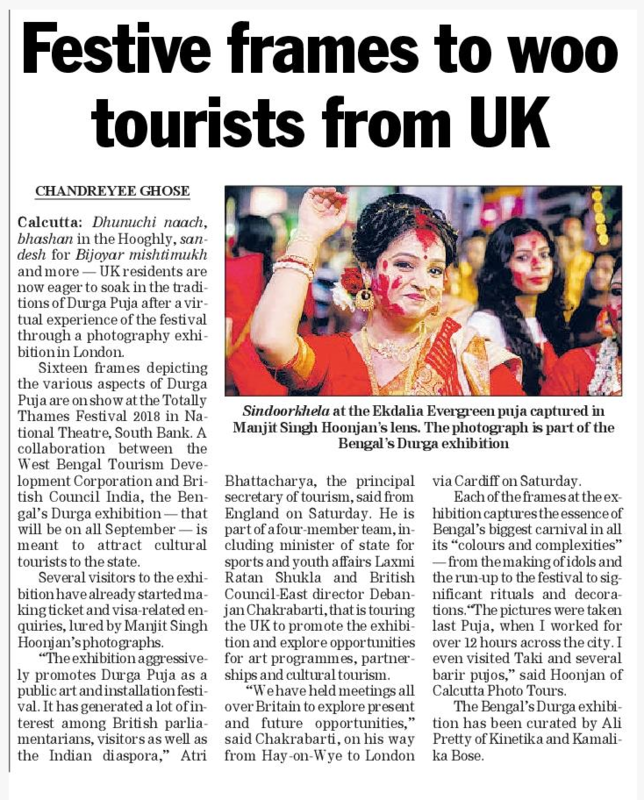 A Journey of surprises along the Hooghly to celebrate a major bilateral year of cultural exchange between the UK and India. Download the press release here. 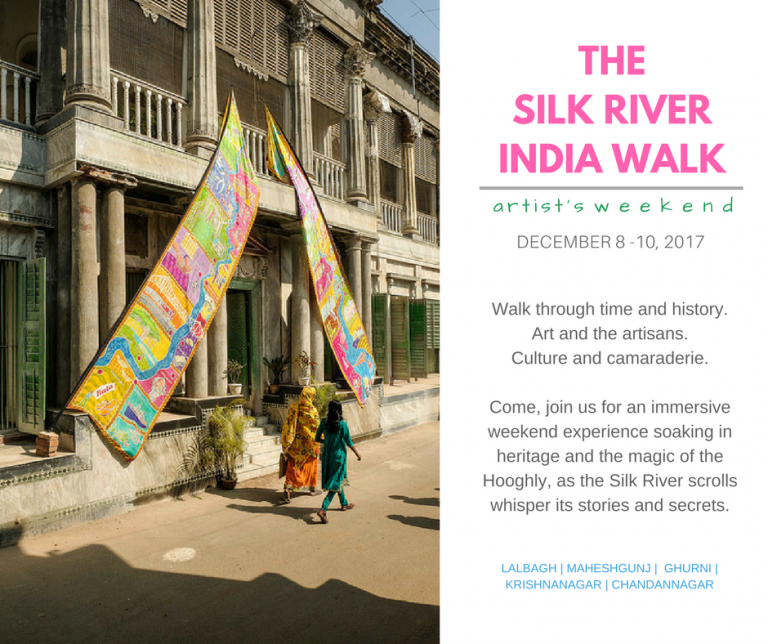 Silk River India Walk Flyer out now! 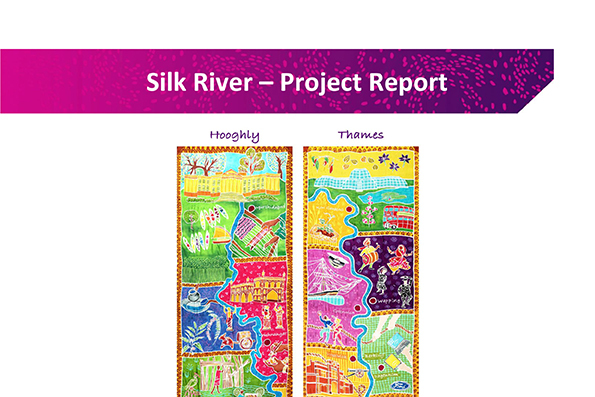 We're delighted to announce that the Silk River India Walk flyer is out now! 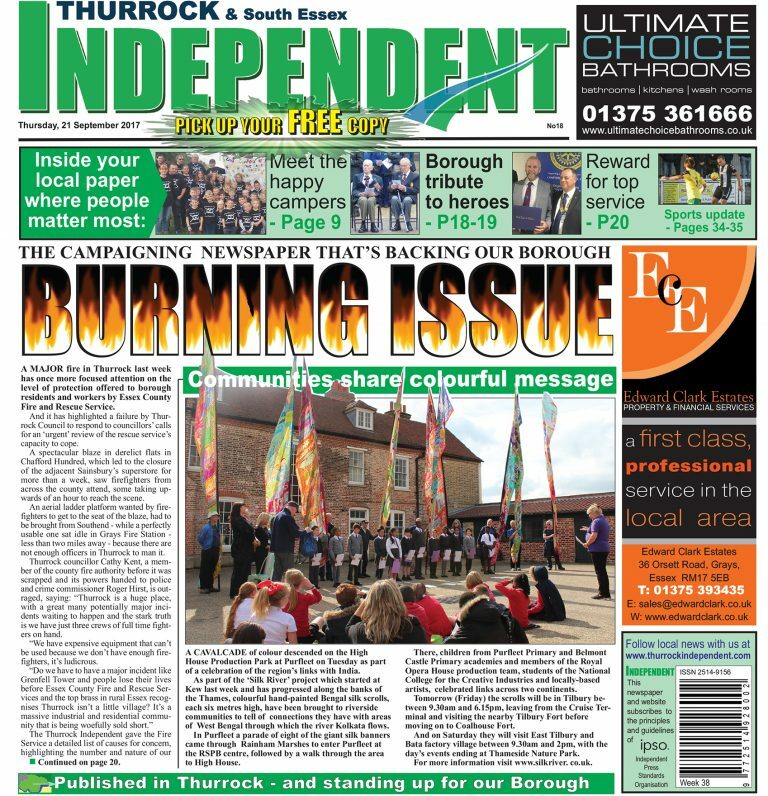 Download yours here, or read it on the website. 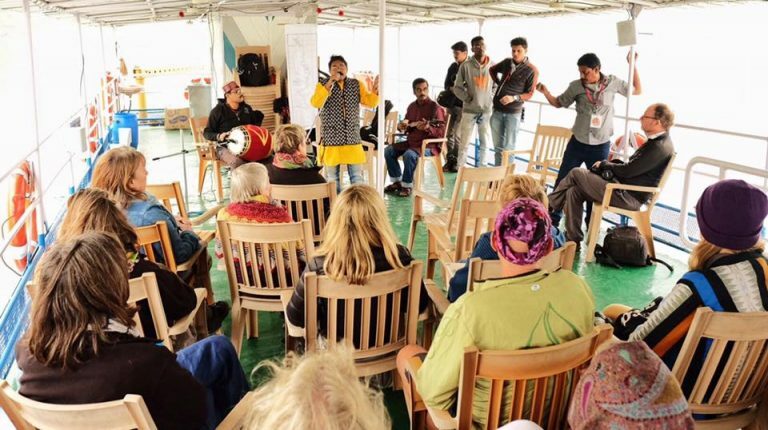 Join us for an an immersive weekend experience soaking in the heritage and the magic of the Hooghly River, as the Silk River scrolls whisper their stories and secrets! 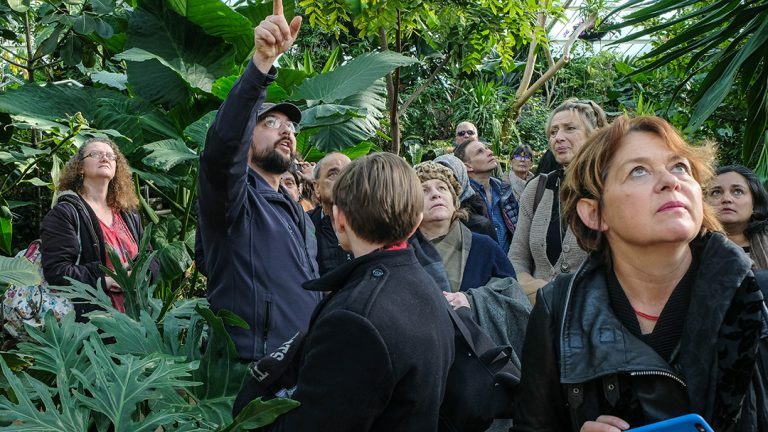 Indian artists are invited to this exchange with 15 visiting artists from the UK. 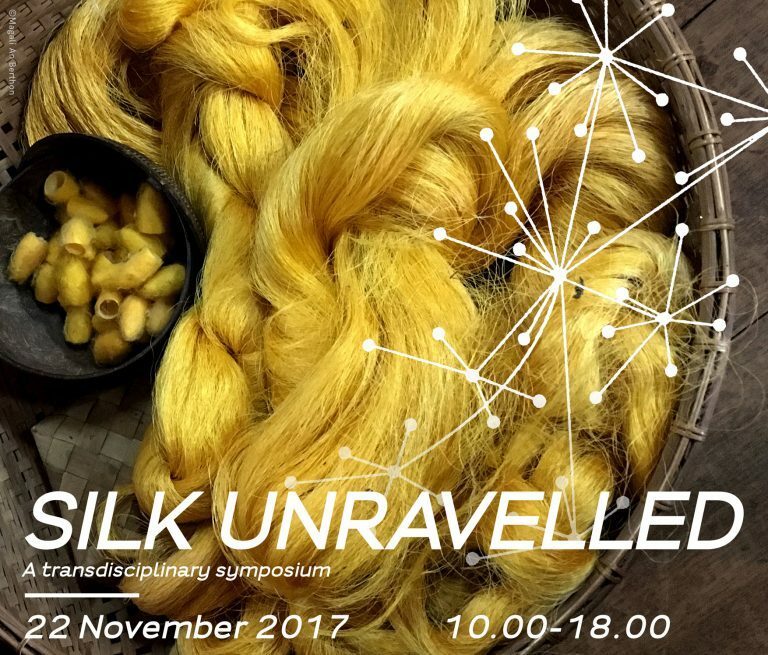 We're delighted that Steve Shaw’s Silk River film is being shown as part of Silk Unravelled Symposium on 22nd Nov, in London. 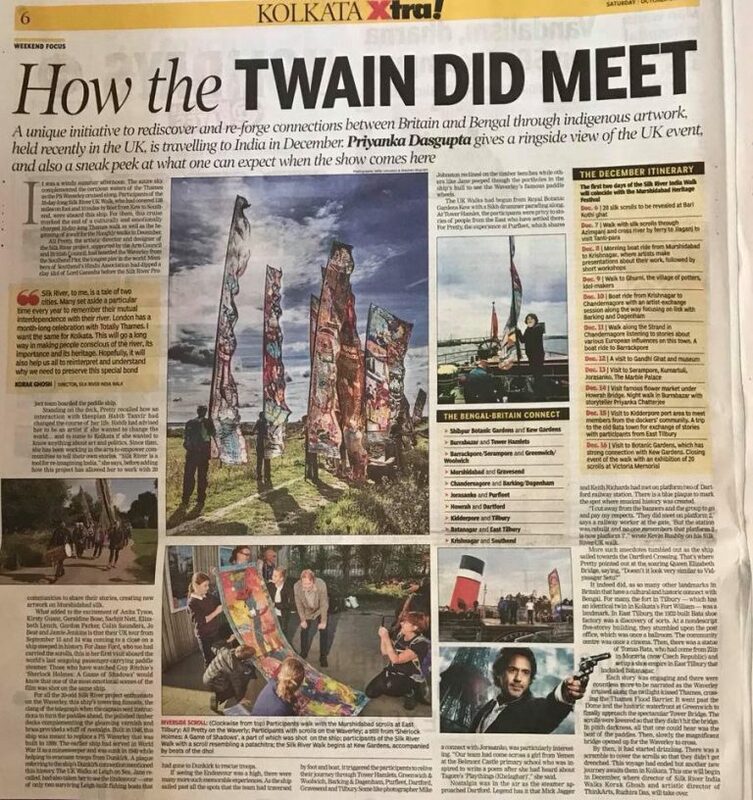 Times of India - How the Twain did Meet. 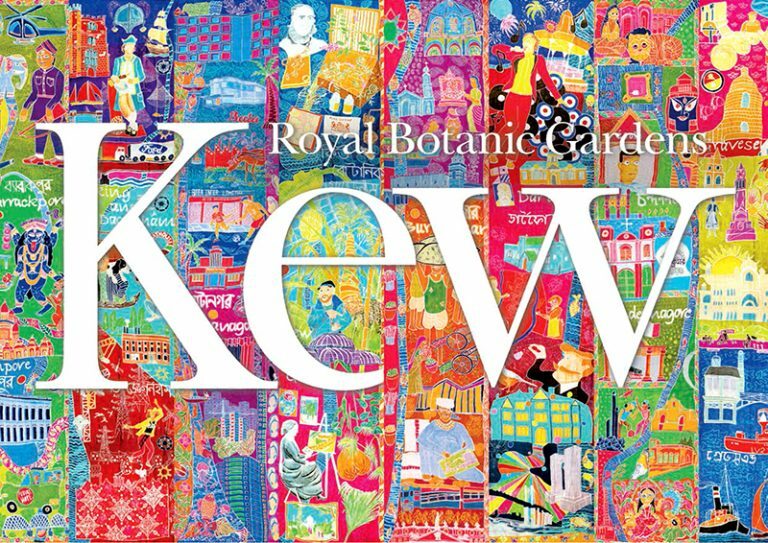 A unique initiative to rediscover and reforge connections between Britain and Bengal through indigenous artwork is travelling to India in Dec.
What a fantastic exhibition it was at Kew Gardens 22-27th Oct. 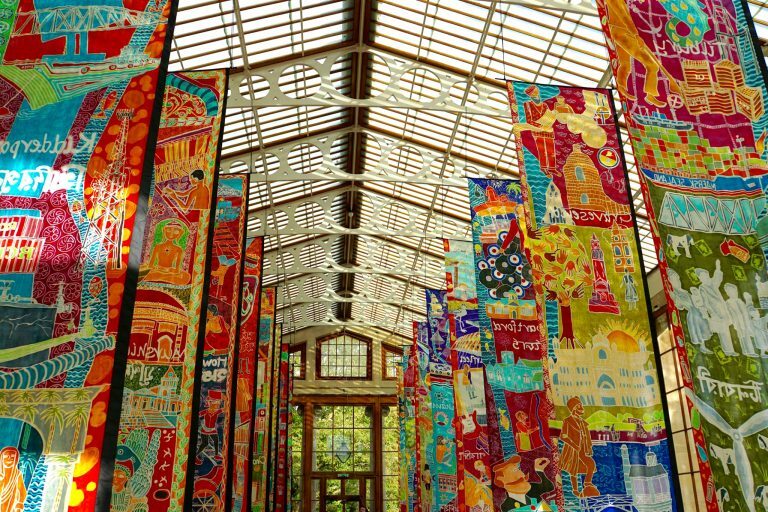 This is the last time all 20 scrolls were displayed together before they travel India for the Silk River India walk. Thursday 16 November 2017 5.30pm - 8.30pm. 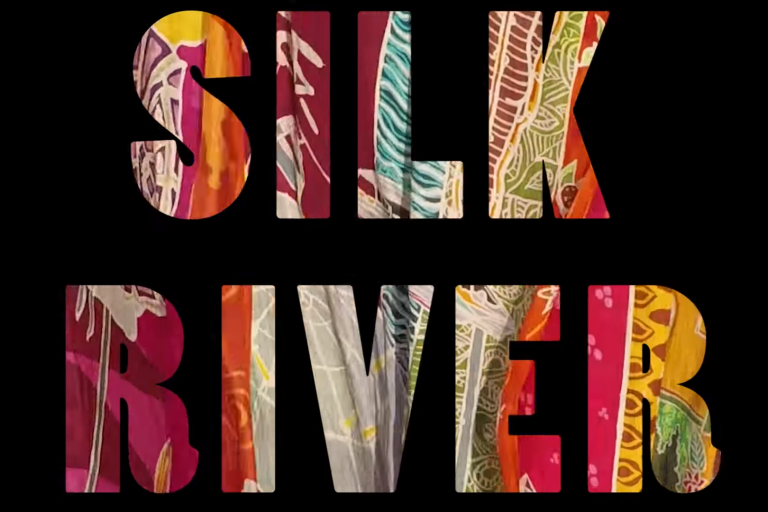 ‘A’ Team Arts presents Silk River Forever Hoorah! Silk River Forever Hoorah! 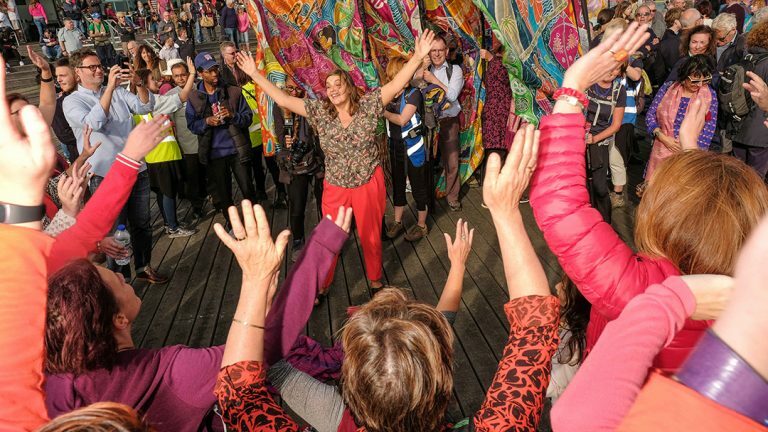 is adapted for the stage and devised as part of the Silk River performance walk by the House of Talent youth. 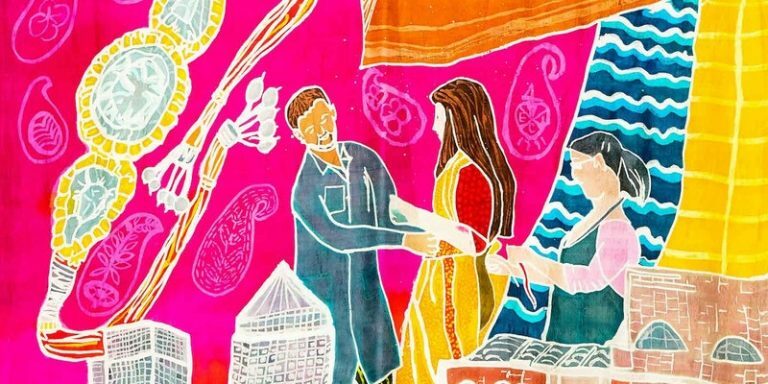 This production follows the changing migration, trade and social landscape of Tower Hamlets through song, drama, spoken word and declamatory storytelling. 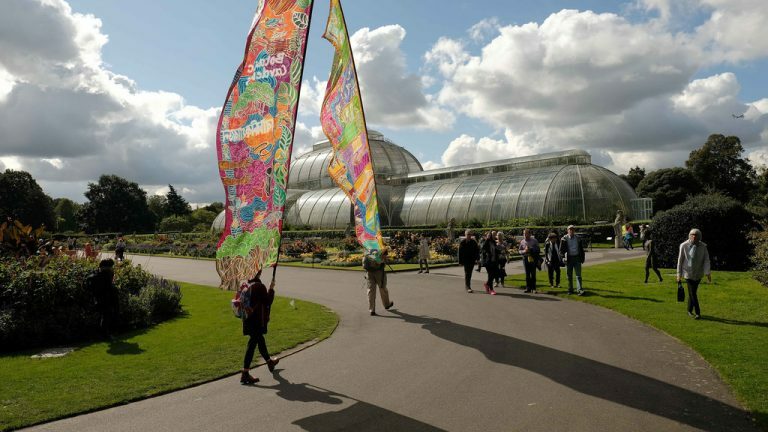 Kew Gardens is collaborating with outdoor arts organisation Kinetika, on the ambitious Silk River project, connecting 20 communities along the Thames Estuary and India's Hooghly River. 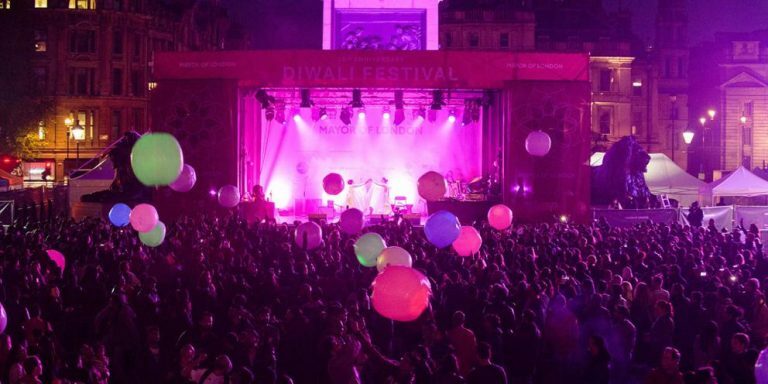 A cultural project based at High House Production Park, Purfleet, opened proceedings at Diwali in central London last weekend. 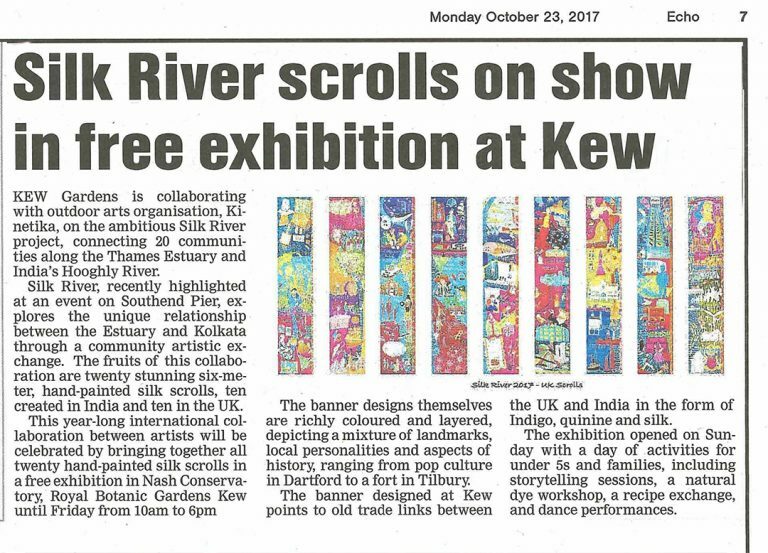 The Silk River Scrolls feature in their very own exhibition at the Royal Botanic Gardens Kew 22-27th Oct.
What a wonderful day at Diwali in Trafalgar Square! 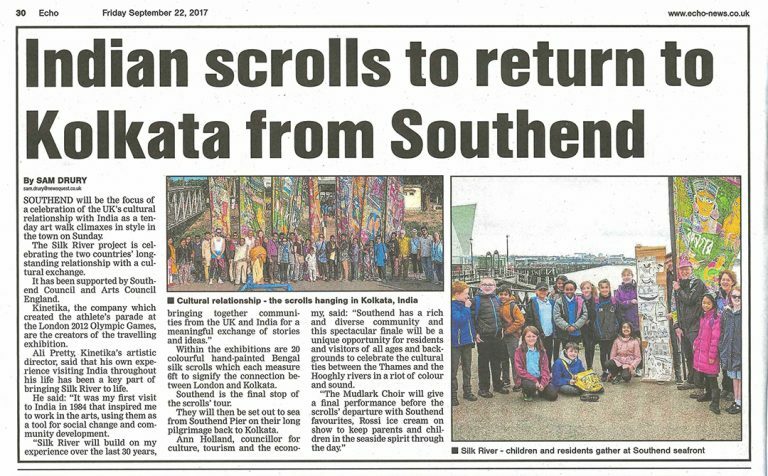 Huge thanks to all the scroll carriers who represented their areas from Kew to Southend and to Jane Ford for choreographing the procession. 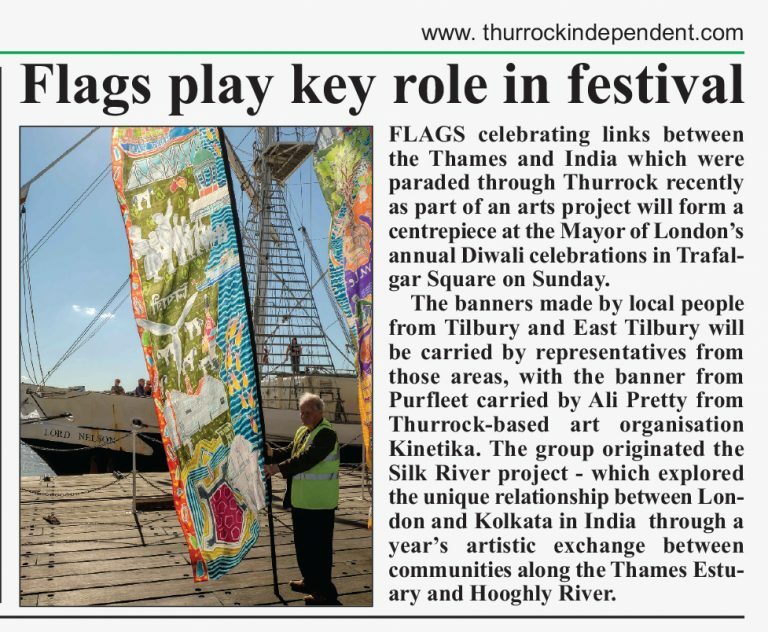 Appearing in the Thurrock Indpendent today, 12th Oct, a short piece about the Silk River scrolls featuring in the Diwali celebration at Trafalgar Square on Sunday 15th Oct.
As reported in Your Thurrock on 11th Oct 2017, Silk River scrolls are to take part in Diwali at Trafalgar Square. 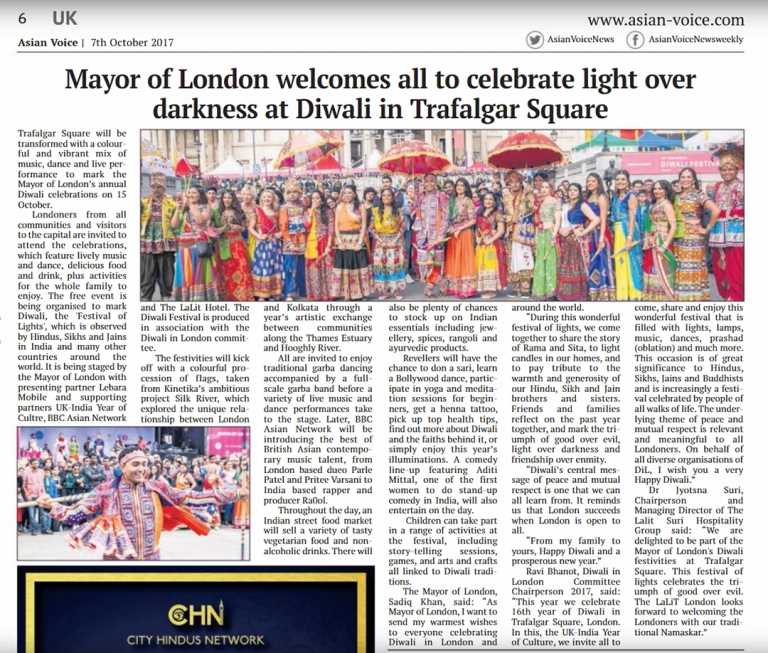 The Asian Voice covered the Diwali in London story where the Silk River scrolls featured as opening moment in the parade, and later as site decor. 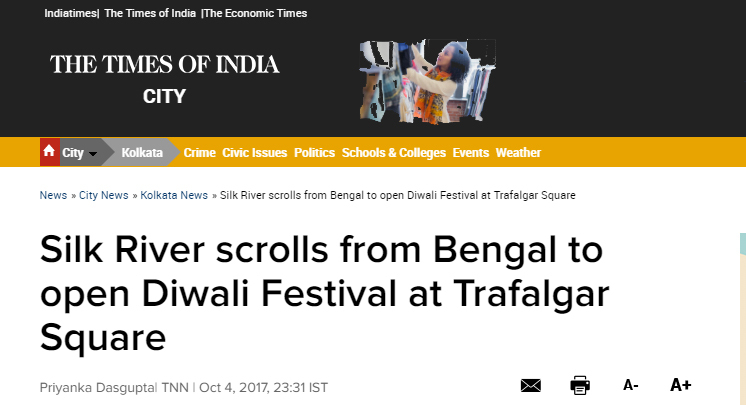 The Times of India has reported "Silk River scrolls from Bengal to open Diwali Festival at Trafalgar Square"
We're delighted to announce that the Silk River Scrolls have been invited to open the Diwali celebration in Trafalgar Square. 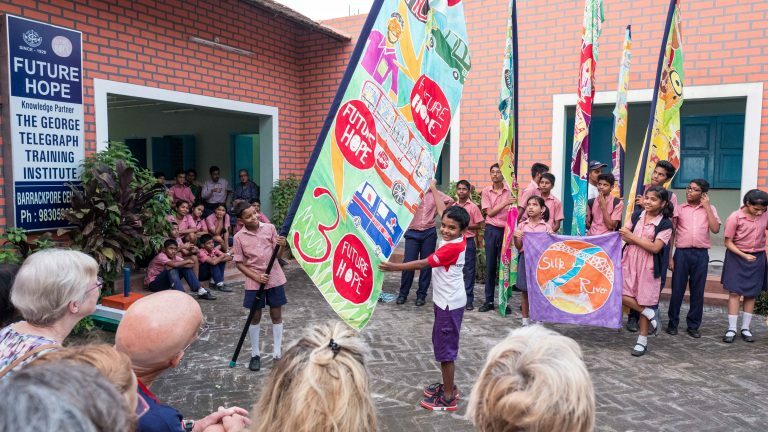 Leigh hosted the final day of a cultural art exchange celebrating the UK's relationship with India. 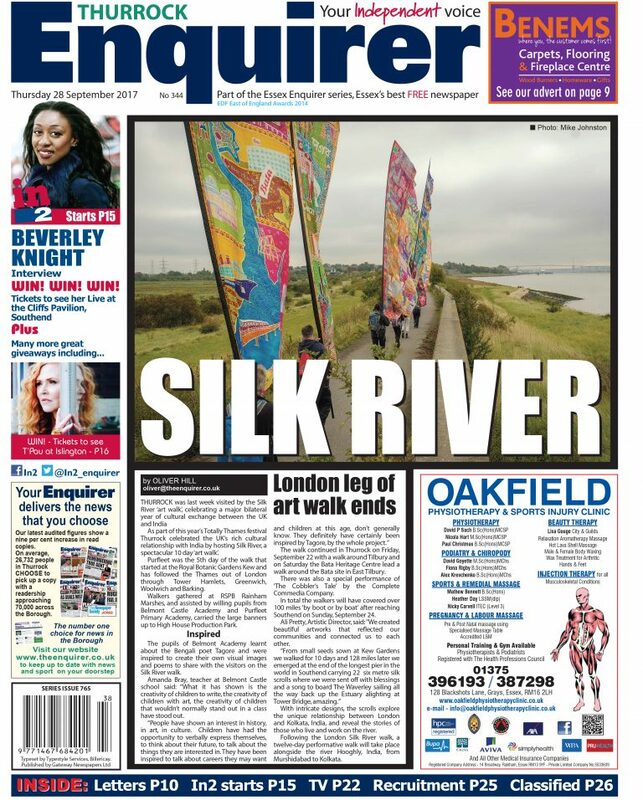 London Leg of Art Walk Ends - Silk River appeared on the front page of the Thurrock Enquirer today. 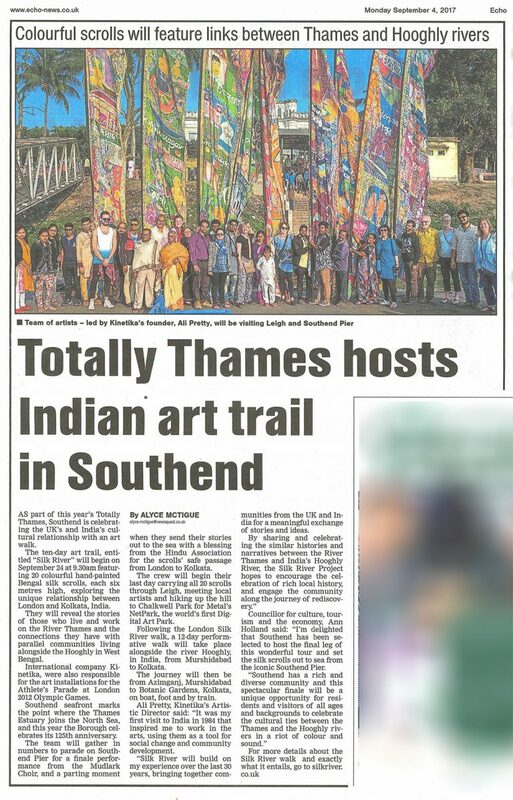 Tilbury and East Tilbury were visited by the Silk River 'art' walk this week to celebrate a major bilateral year of cultural exchange between the UK and India. 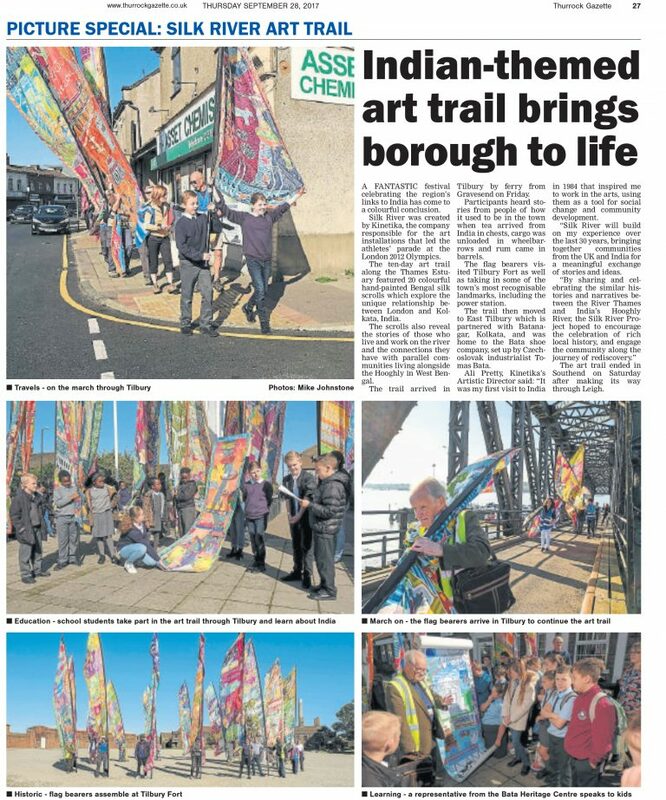 Indian Themed Art Trail Brings Borough to Life. 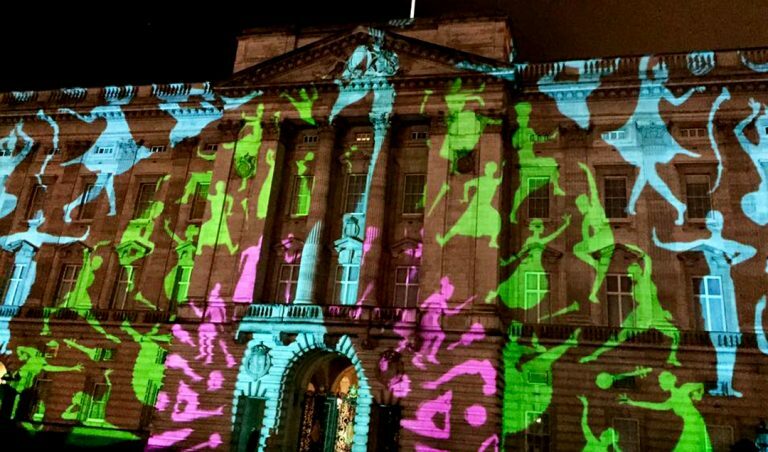 A fantastic festival celebrating the regions links to India has come to a colourful conclusion. 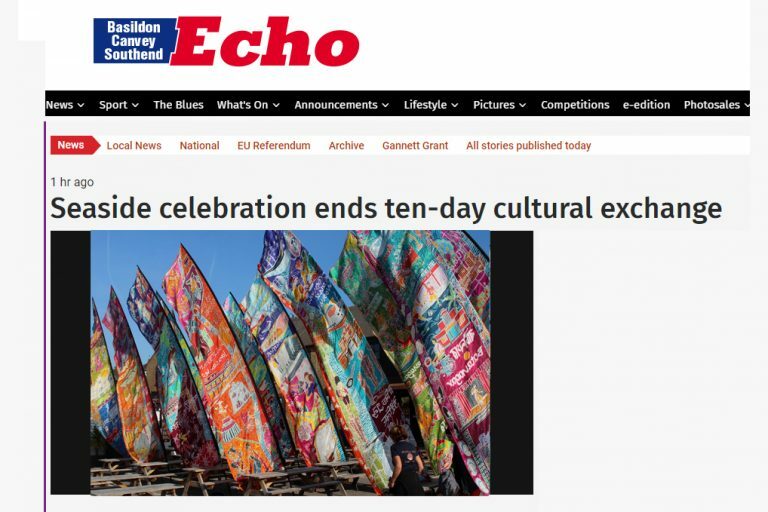 The Echo Southend reported on the finale of the UK Walk on 24th Sept, appearing online and in the paper on 28th Sept.
After carrying the 22 Silk River banners 128 miles (206km) on foot and 10 miles (16km) by river, triumphant participants from ten areas along the Thames arrived in Southend on Sun 24th Sept. 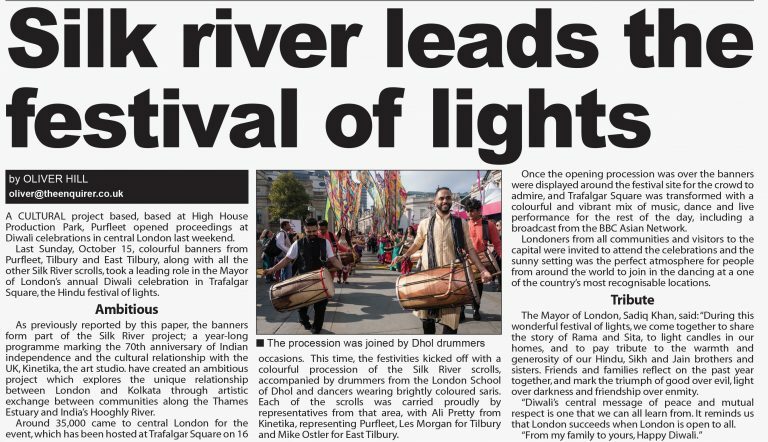 Silk River finale comes to Dartford! 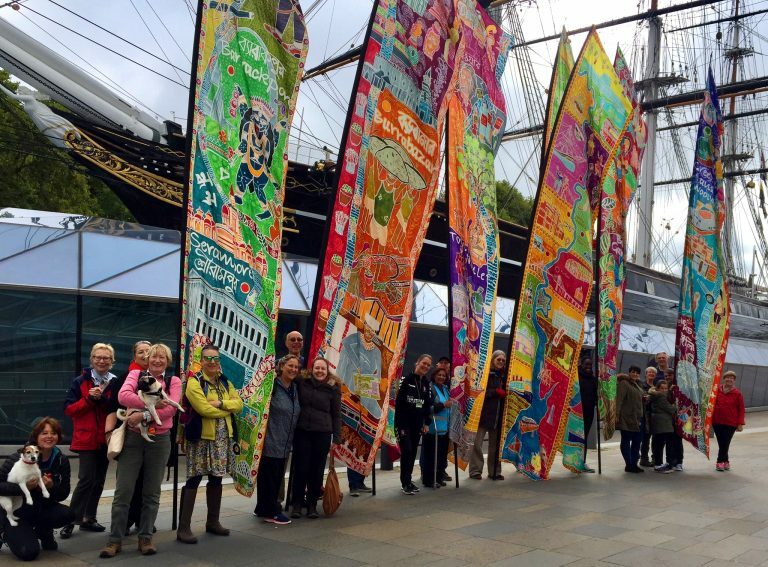 Last Wednesday, 20th September, DAN members joined What If Gallery, Dartford Borough Council, Kinetika, and other Silk River participants on the Dartford leg of the Silk River journey. 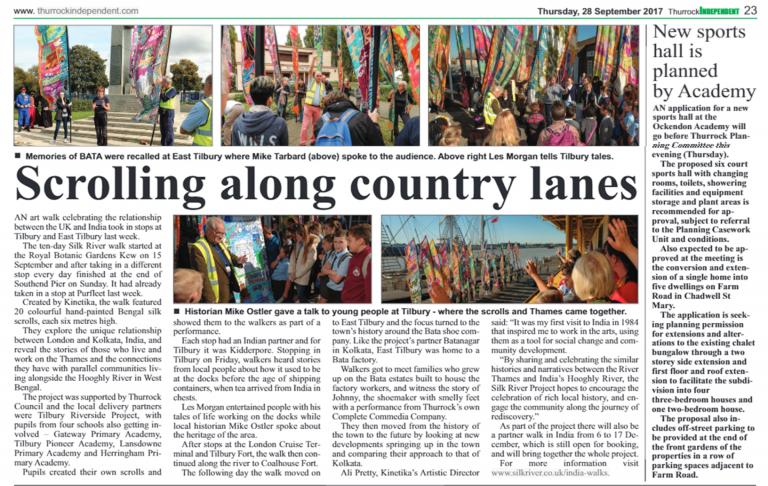 Scrolling along country lanes - The Thurrock Independent covered the Silk River walk in Tilbury and East Tilbury this week. The Quint – what’s Linking London with Bengal? 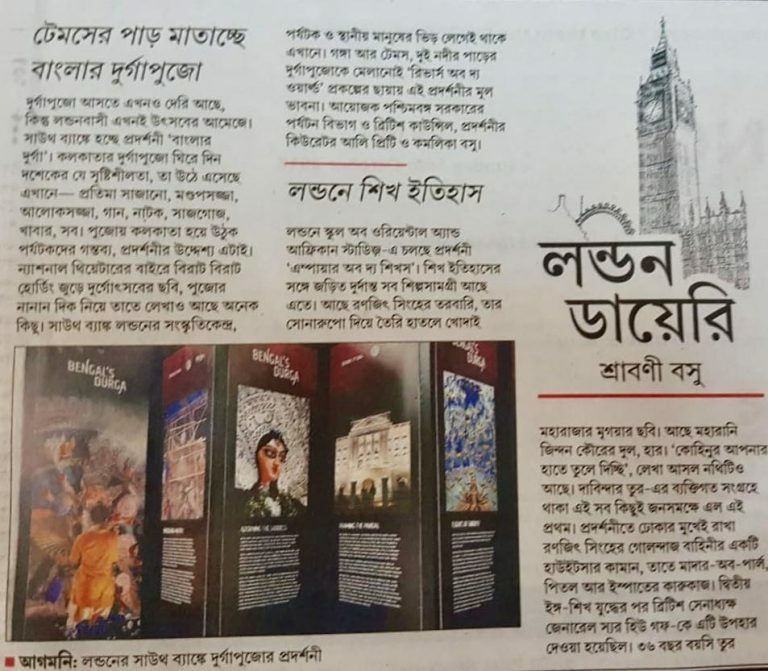 What’s Linking London to Bengal? 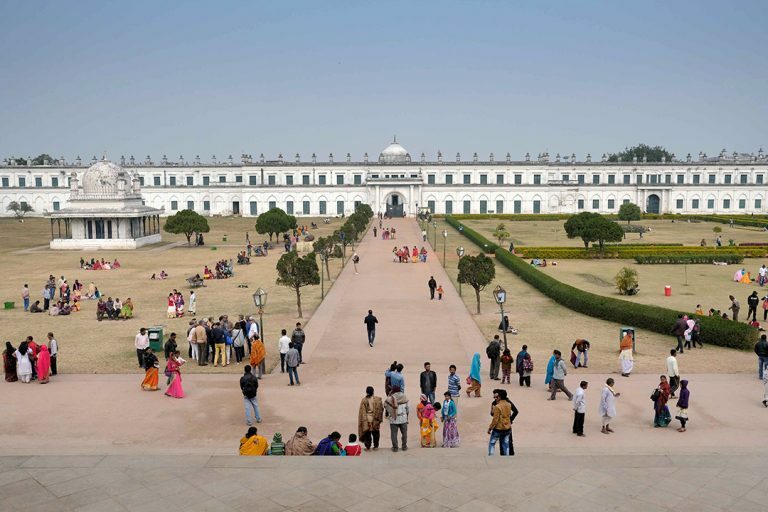 20 Murshidabad Scrolls on Thames. 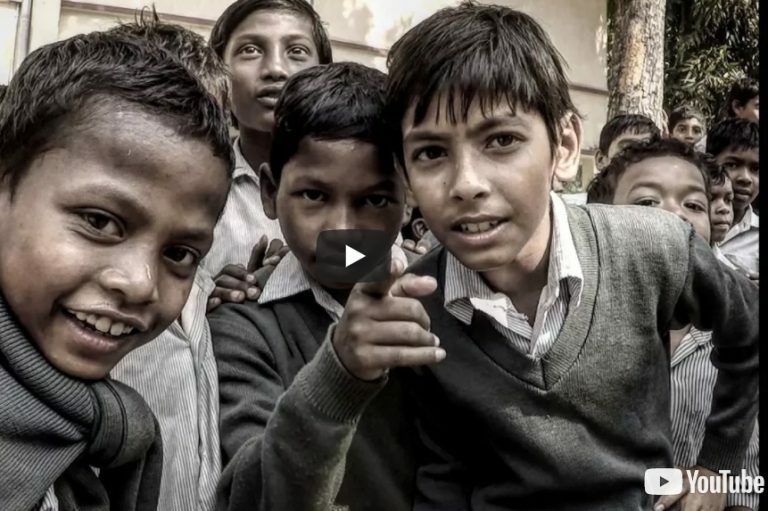 Thank you to Anjana Parikh of The Quint website for reporting on our project. All ten of the Silk River UK walks are now complete! What an amazing journey - 138 miles by boot and by boat from Kew all the way to Southend on Sea. 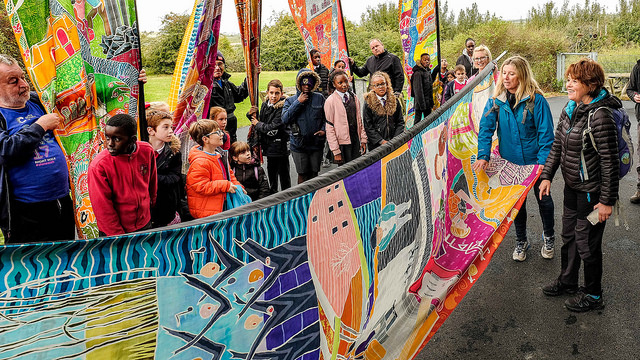 We would like to extend a heart felt thank you to all the partners, performers, artists, walk leaders, link walkers, schools, teachers, boat owners and participants who made it such an outstanding success. 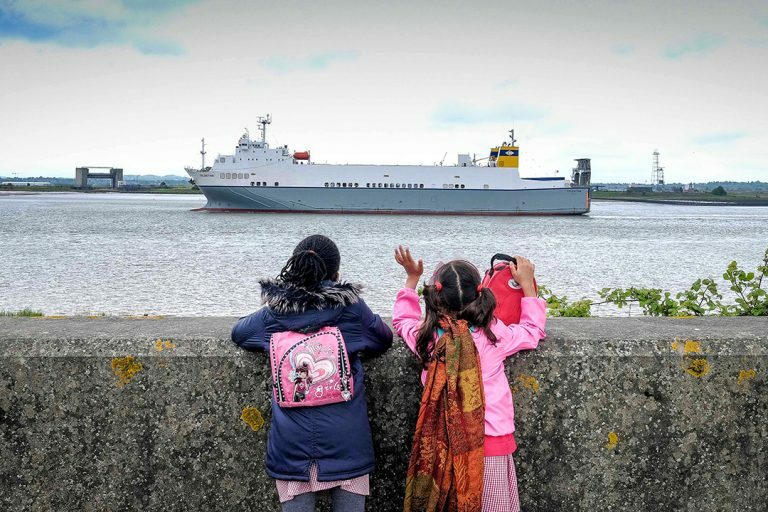 As part of this year’s Totally Thames festival, on Fri and Sat last week Tilbury and East Tilbury celebrated the UK’s rich cultural relationship with India by hosting Silk River, a spectacular 10 day art walk. Dawn on the last day of our journey and I’m staring out the window into a tarnished silver mirror that is the Thames estuary. It is a perfect day for a walk.. 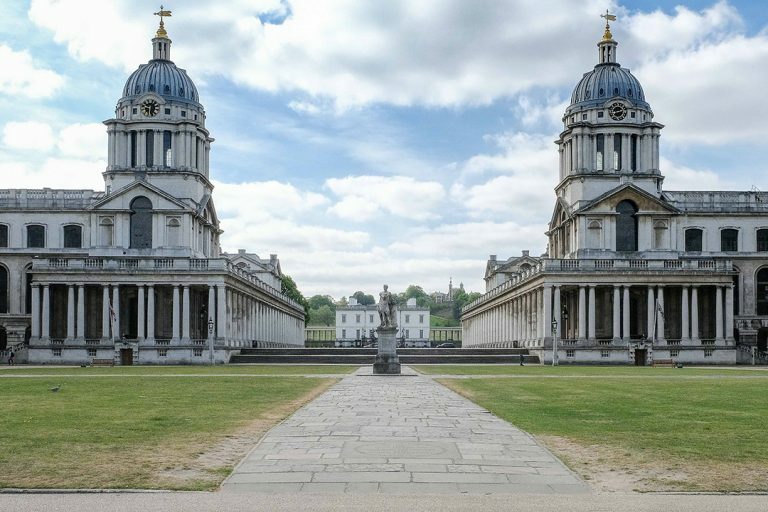 It has taken a week of walking from Greenwich to reach a place that knows for sure that it is picturesque. 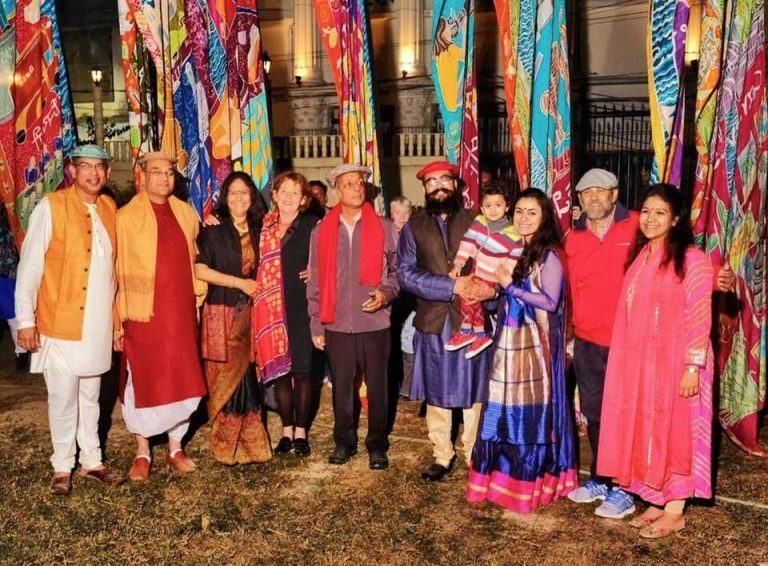 Southend will be the focus of a celebration of the UK's cultural relationship with India as a ten-day art walk climaxes in style in the town on Sunday. Great to see that Silk River is getting press in India too! This was sent to us by our Indian partners. 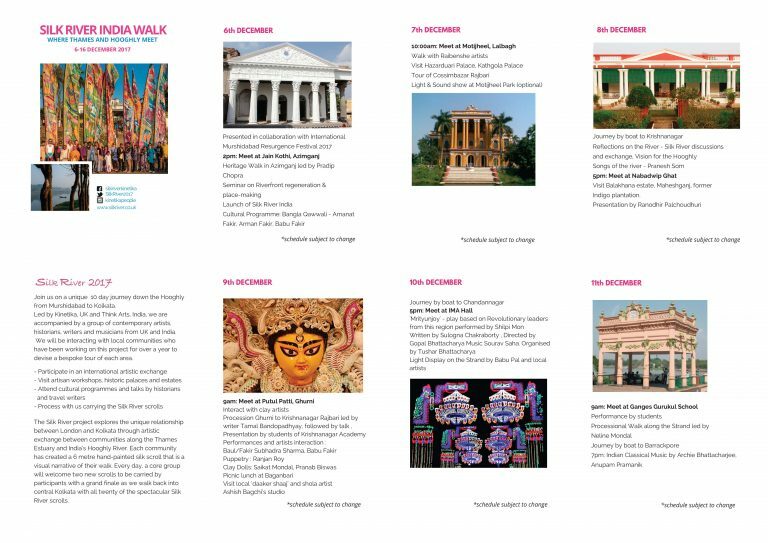 The Silk River walk will be visiting West Bengal Dec 6-17th, we can't wait. We enter a strange landscape where a Porsche dealer is neighbour to a strip of woodland filled with rubbish: a duvet hangs in a tree, a tiny vole lies dead on the cycle path. Just after dawn I peer out the window of the working men’s hostel where we are staying on the Isle of Dogs and see a fox, a squirrel and a crow disputing the contents of a rubbish bin. If yesterday was all trees and lovely riverside views, today promises to be very different. 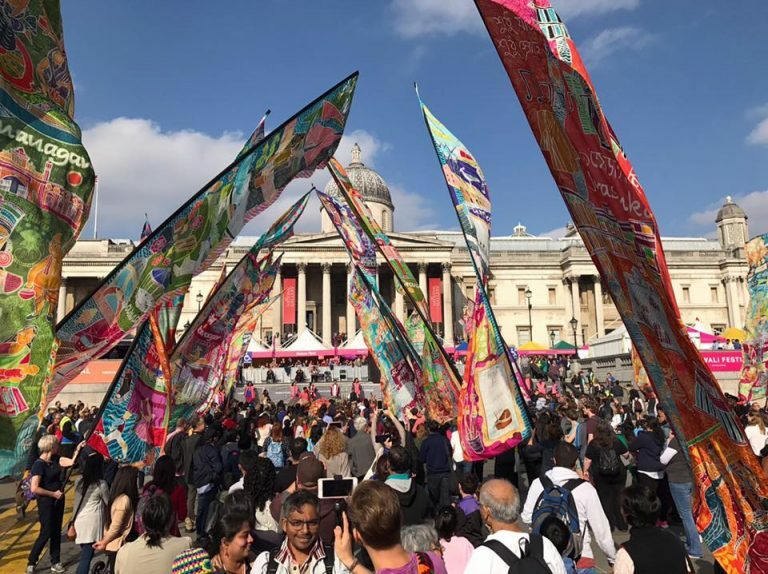 You can’t walk down a London street carrying a seven-metre tall flag without drawing attention. 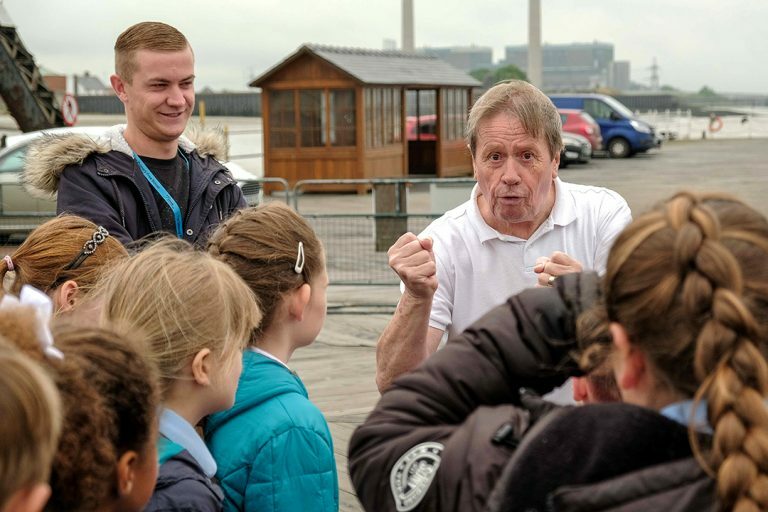 10 Day Count Down – Southend! In 10 days time we will begin our last day carrying all 20 scrolls through this thousand-year-old community of fishermen. 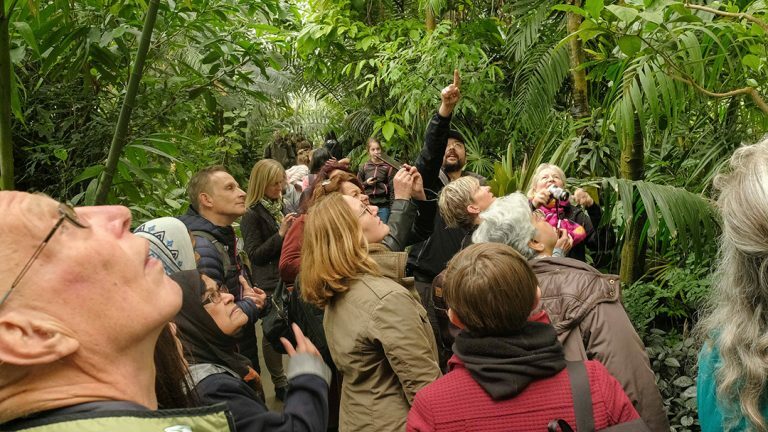 We will meet local artists and see Metal’s digital exhibition on ipads as well as be treated to a performance from the Mudlarks Choir, amongst other surprises. Oh my goodness, it's day 9 of our 10 day count down! Well what a treat we have for you today! 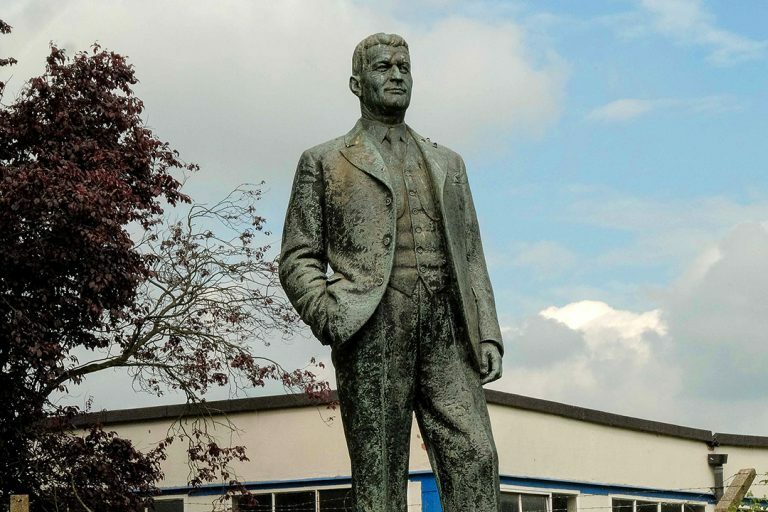 The Bata Heritage Centre are leading the walk to give you real insight into the buildings and local history, and very generously they have agreed to provide real props for the performance. Silk River Film Showing at the BFI Tomorrow 13 Sept! 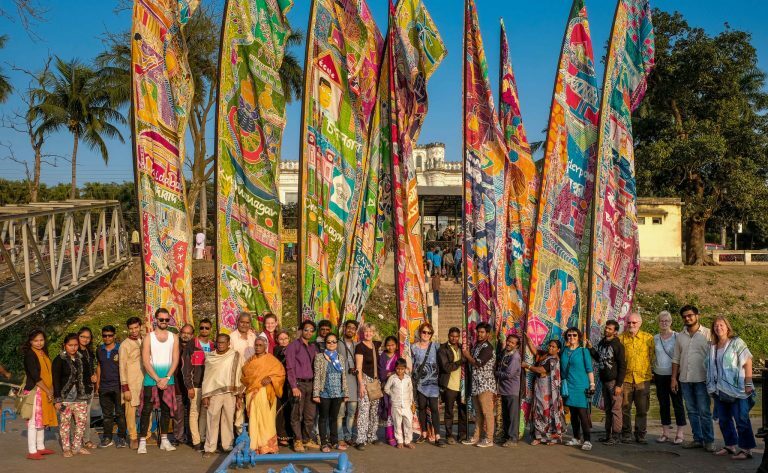 As part of Totally Thames, Kinetika present a Silk River film screening looking at how this ambitious project has explored the unique relationship between London and Kolkata through artistic exchange between communities along the Thames Estuary and India's Hooghly River. The screening will be followed by a question and answers session with some of the project's key partners. 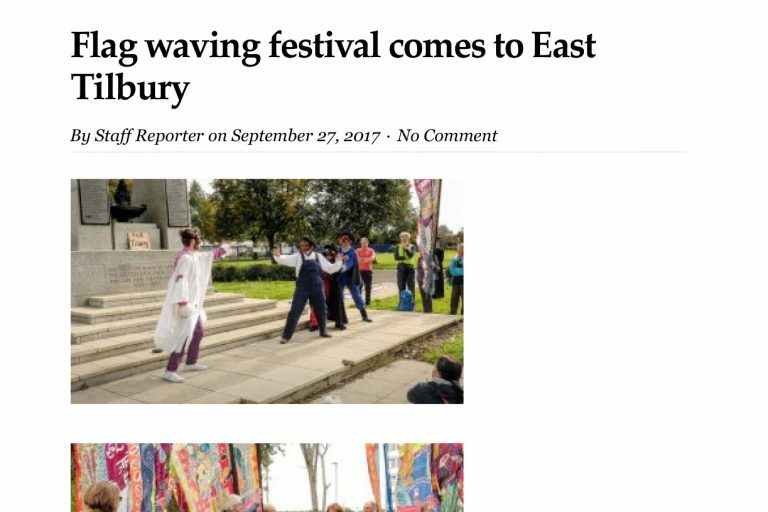 On the 21st Sept we are in 'Gateway to the world', otherwise known as Tilbury! 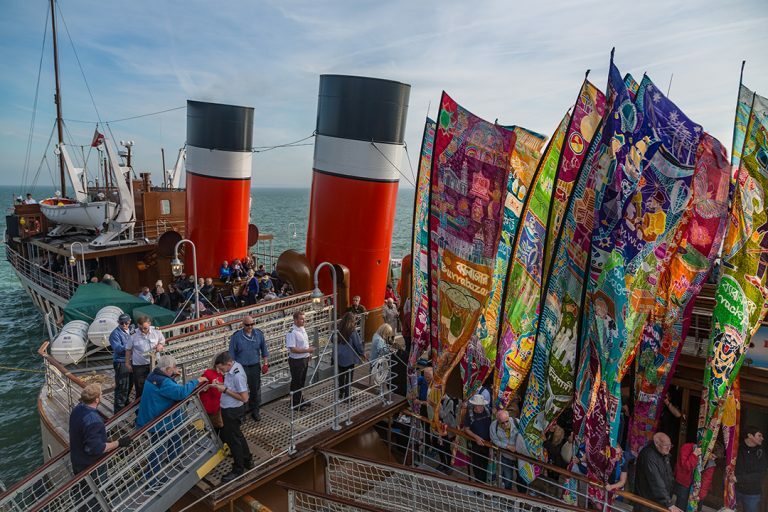 It is still a very busy port and we will hear stories of how it used to be before the age of shipping containers, when tea arrived from India in chests, cargo was unloaded in wheelbarrows and rum came in barrels. It's day 7 of the 10 day countdown! 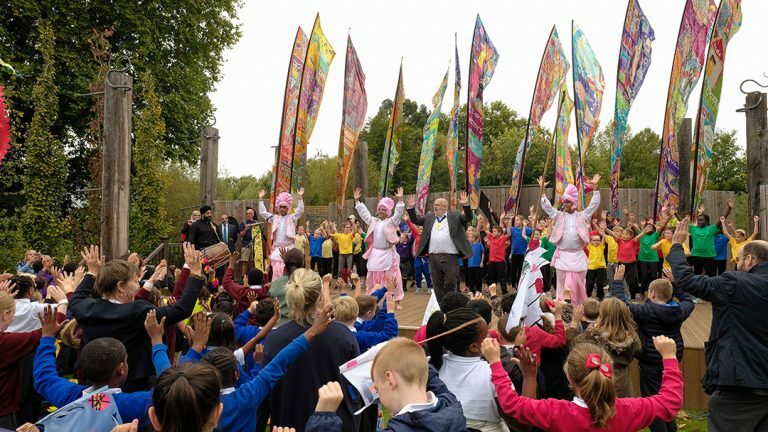 On the 21st Sept we will be discovering an area with an industrial history of cement, bricks and paper that sits alongside Europe’s finest Gurdwara. 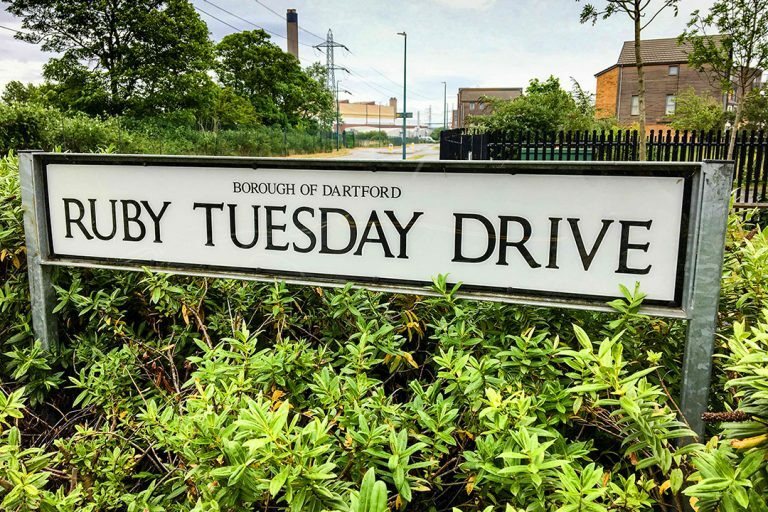 On 20th Sept, only 10 days away, we'll be enjoying a 4.2 mile walk around Dartford and discovering the legacy from its pop culture past that still thrives in the town today. 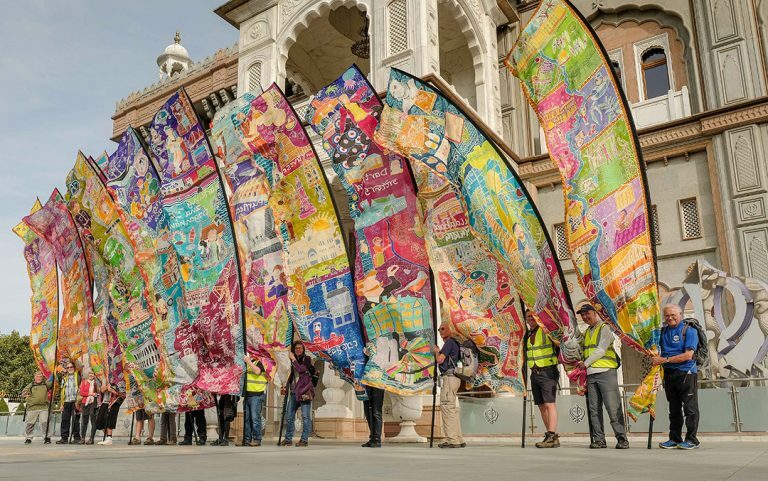 As part of this year's Totally Thames, Southend is celebrating the UK's and India's cultural relationship with an art walk. 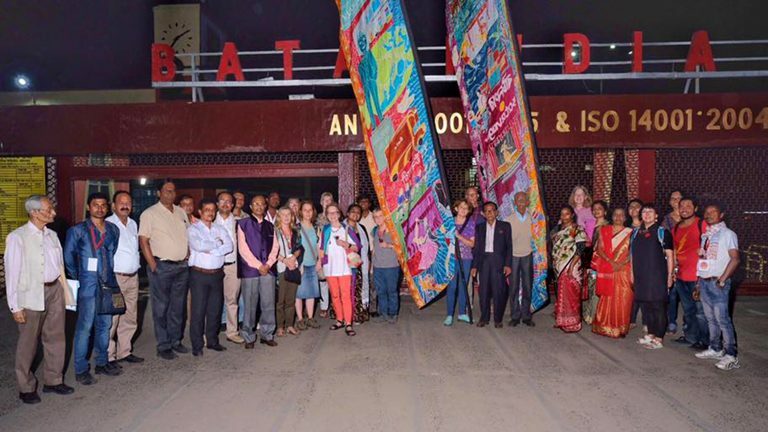 Southend will host a spectacular art walk this month to celebrate a rich cultural relationship with India. 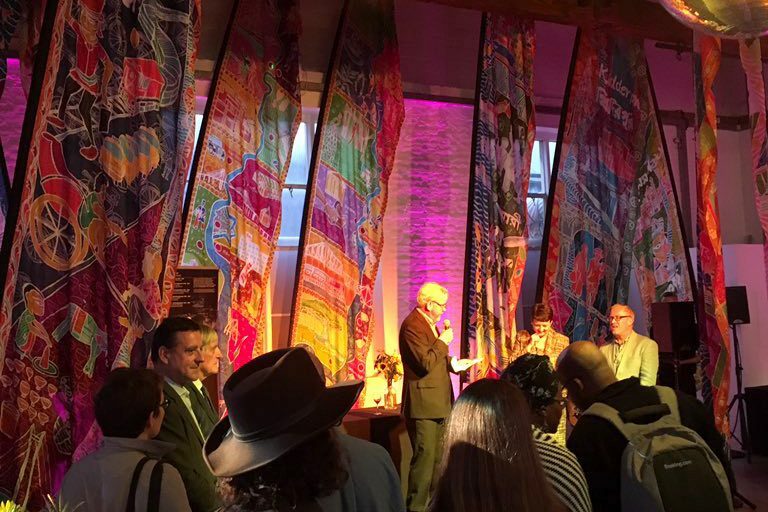 All twenty of the hand painted Silk River Scrolls were finally revealed together at the Totally Thames launch party on 30th Aug. It was the first time that they had all been seen together. 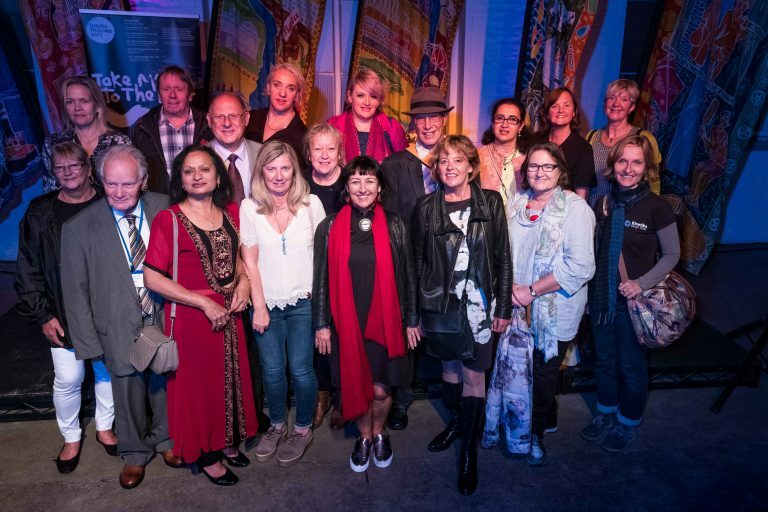 Representatives from all ten UK Silk River partners were there to see them, and we were delighted to have been invited to be part of this event produced by Totally Thames. 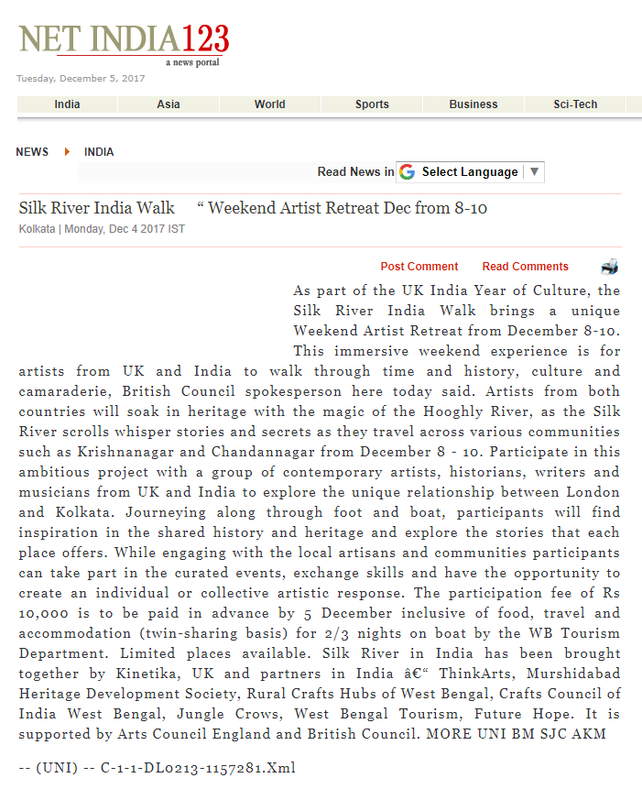 We are very excited to announce that the Silk River Indian Walks are now open for enquiries and booking! 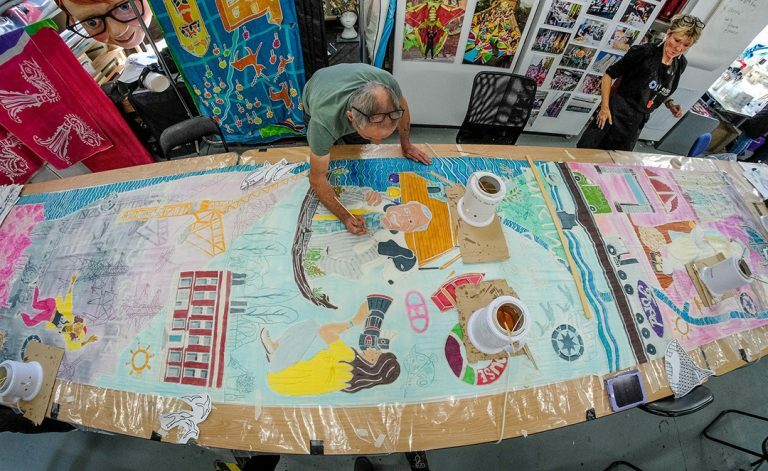 Participate in a unique 12-day International Residency that has been created especially for the Silk River project. 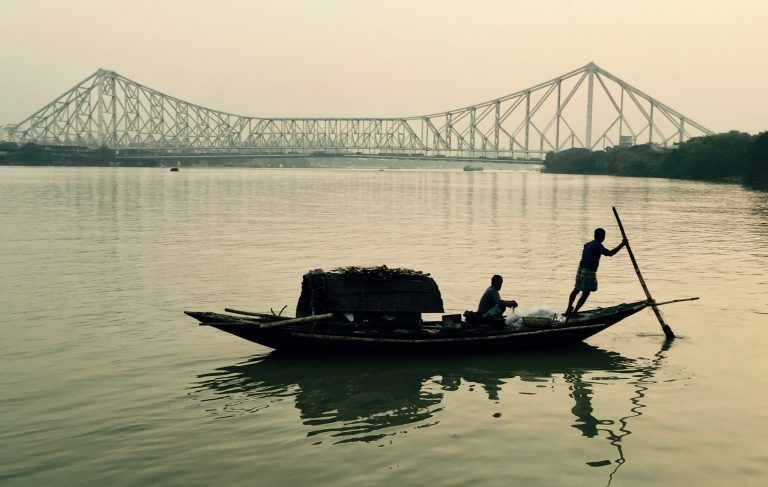 A unique journey down the river Hooghly from Murshidabad to Kolkata. 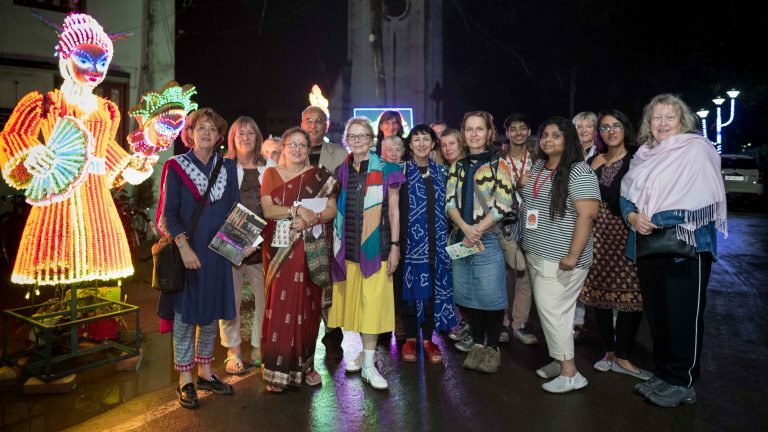 Join a group of contemporary artists, historians, writers and musicians from UK and India for the Silk River India Walk, where you will engage with the local artisans and community members along the way, participate in curated events comprising of talks, workshops and film screenings, share practice, create an artistic response, either individually or collectively. 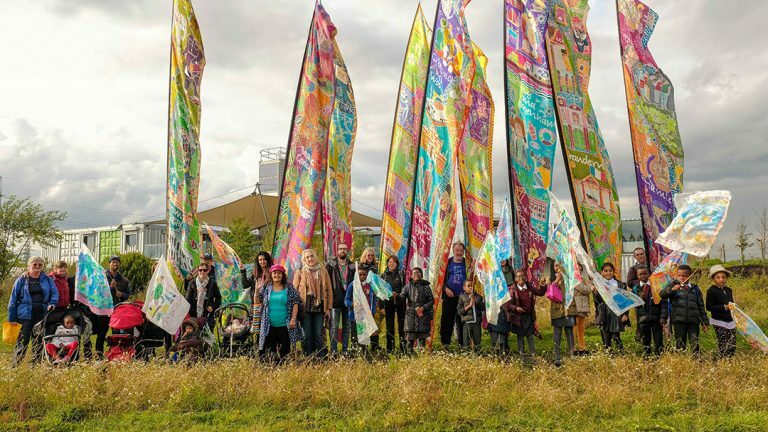 We are delighted to invite you to watch a film screening and panel discussion on the Silk River project, which explores artistic exchange between communities along the Thames and Hooghly. 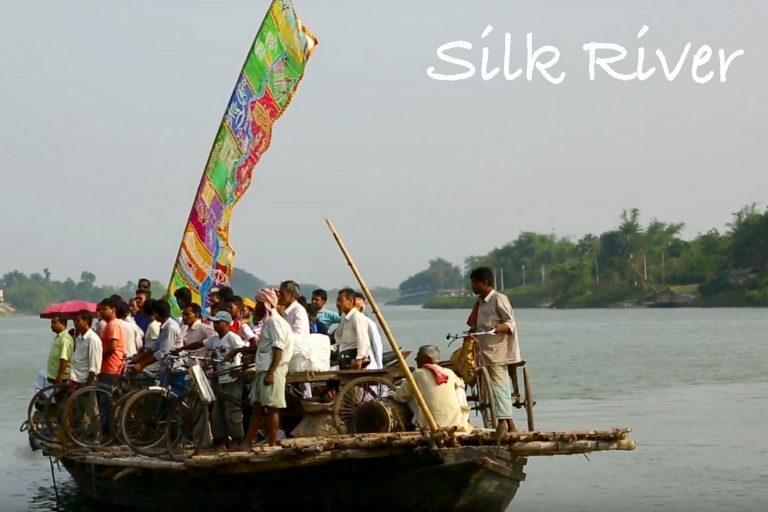 All routes are confirmed and bookings are now live for the UK Silk River walks! The painting is complete for UK Scrolls! Huge thanks to all participants, artists and group leaders! 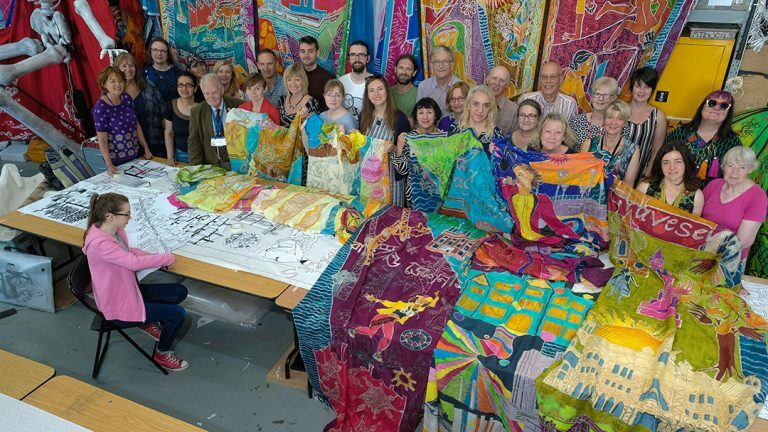 The painting of the UK silk scrolls is now complete! 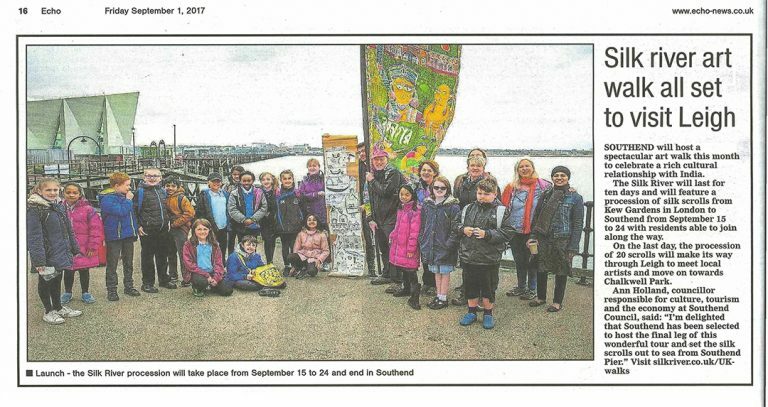 We are delighted that we appeared in Dartford Living in an article about the local groups from that area taking part in Silk River. 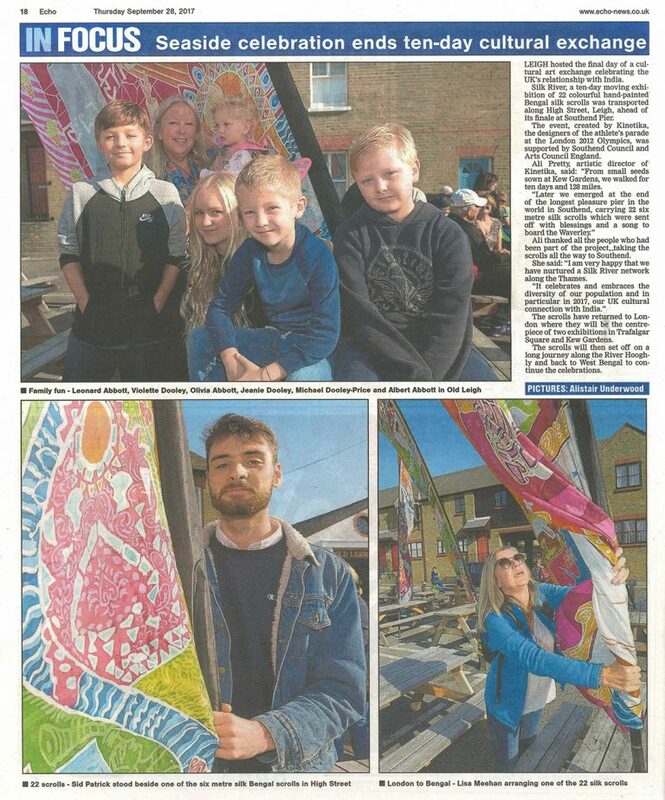 Today there was an article in the Gravesend Reporter about the local groups from that area taking part in Silk River. 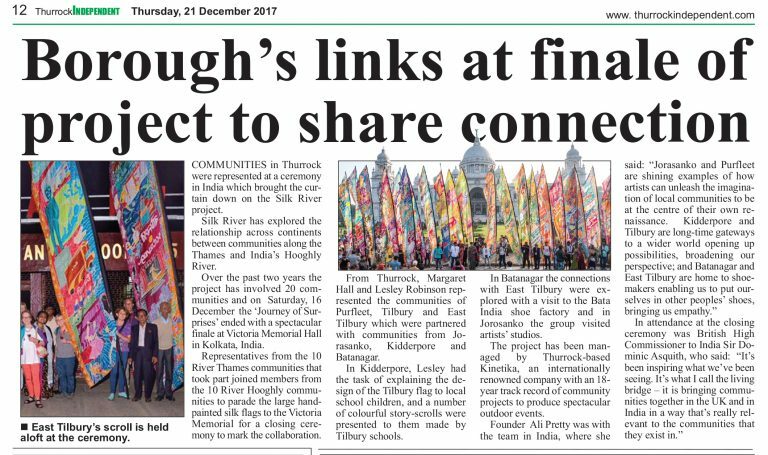 Today there was an article in our local press - Your Thurrock, covering local artists involvement in the Silk River project. 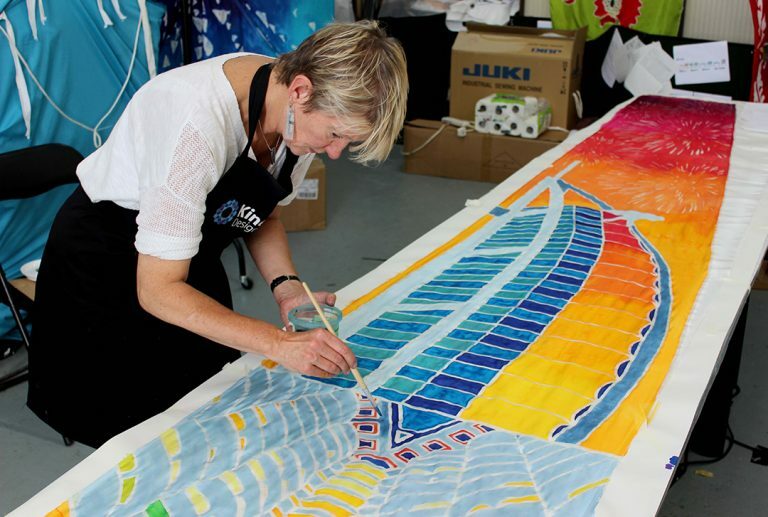 The textile residency has started at the Kinetika studio to paint the UK scrolls. 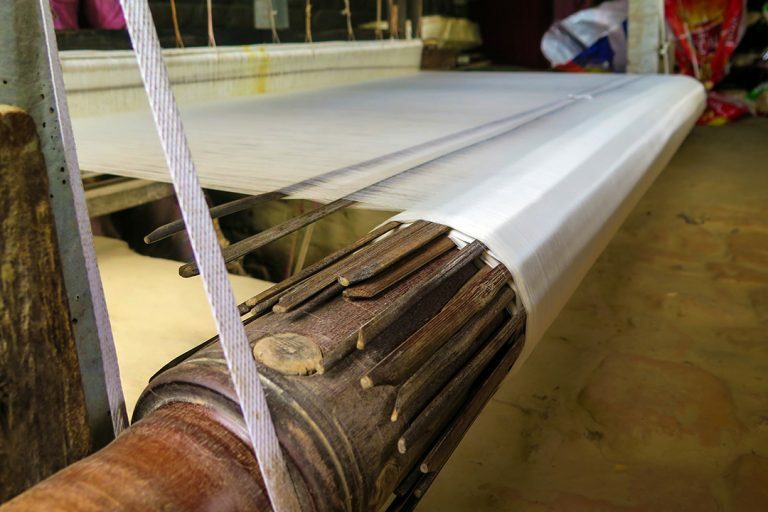 We're using the very precious triple woven, hand made silk from Murshidabad. This is a peek at progress so far! 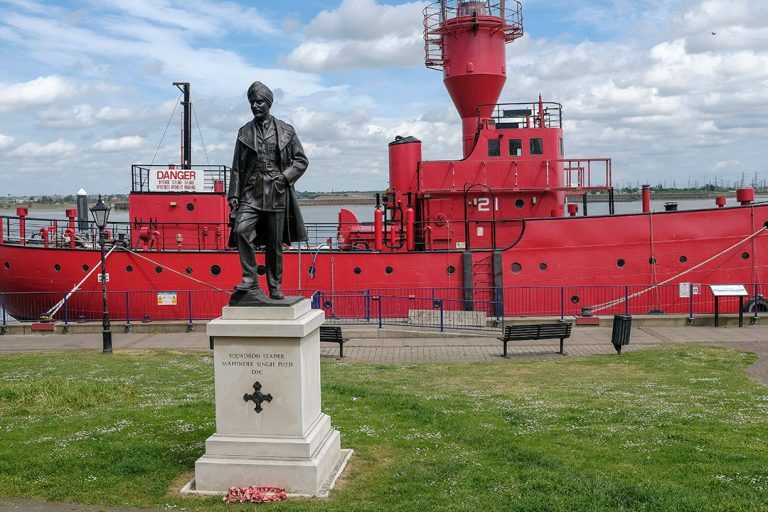 We've continued to uncover the links between UK and India by visiting Dartford, Gravesend, Tilbury, East Tilbury and Southend! Designing the UK Scrolls has begun! What a week; every day exploring the history and identity of a different place! 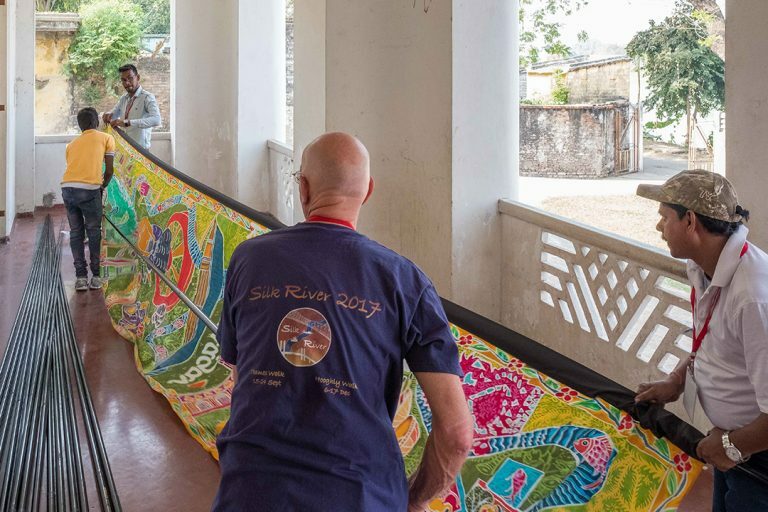 Coinciding with the Isle of Wight Walking Festival & Richard Long’s exhibition, Ali Pretty will be speaking about 'Silk River', this major international walking project that connects the Thames and the Indian river Hooghly. 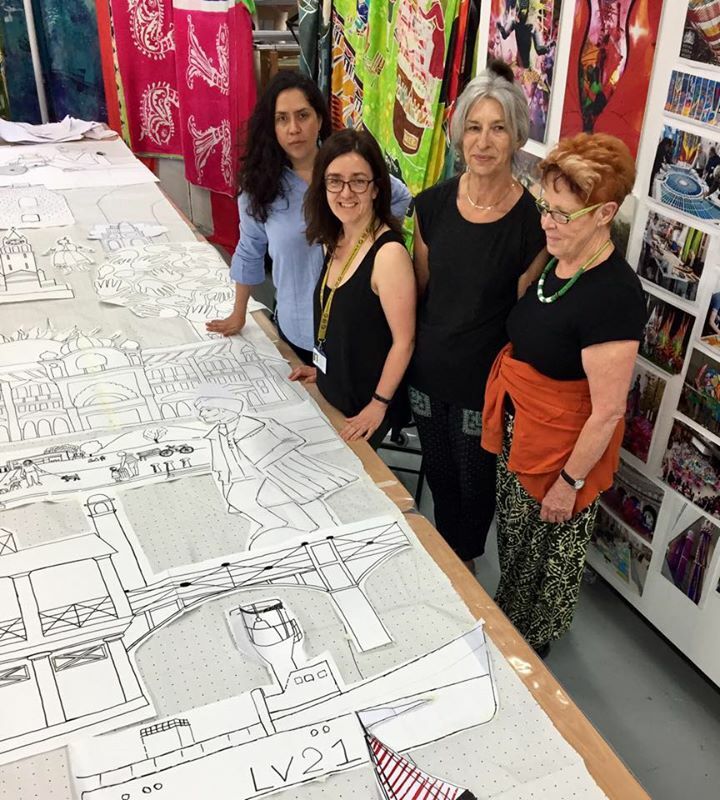 Thurrock Artists – CPD Opportunity! 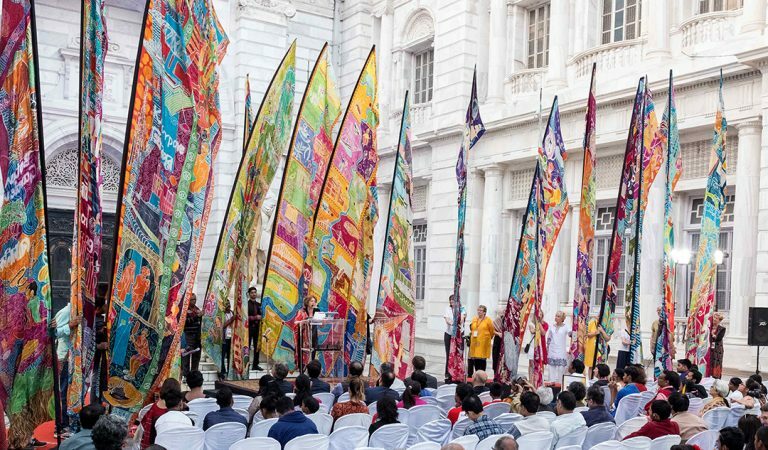 To participate in SILK RIVER, a major arts project involving a cultural exchange between the UK and India. 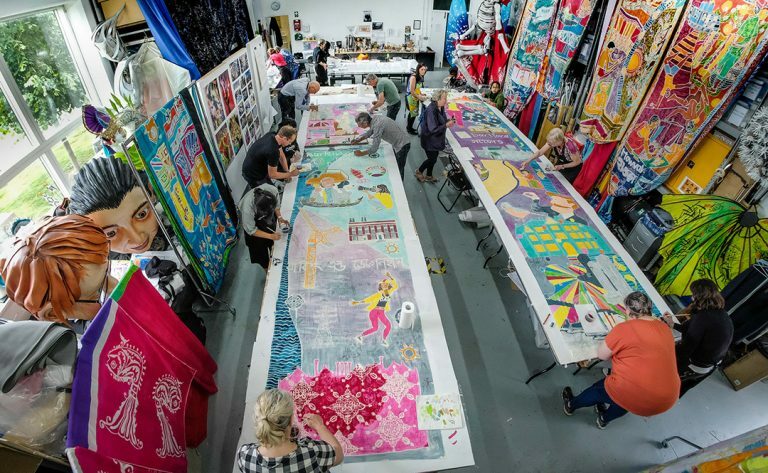 To develop your artistic skills by participating in a 6 day silk batik workshop, led by internationally renowned arts organization Kinetika. 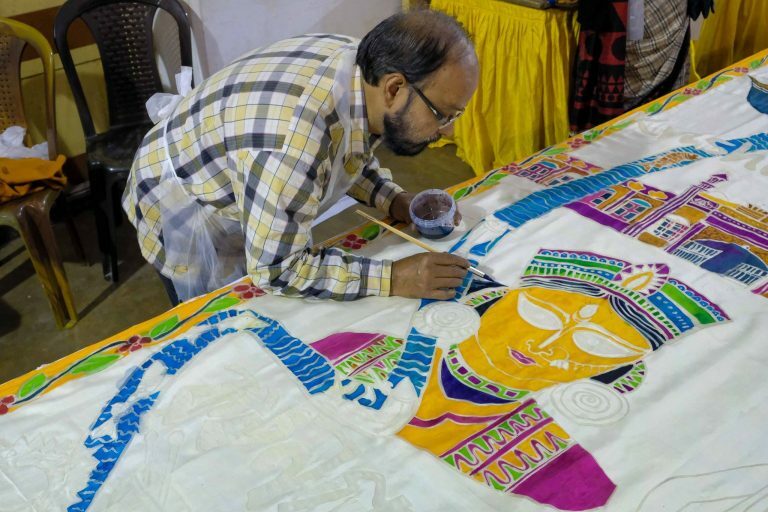 To gain knowledge of your local community and their stories, and those of an India-linked partner, through the development of a silk batik scroll. 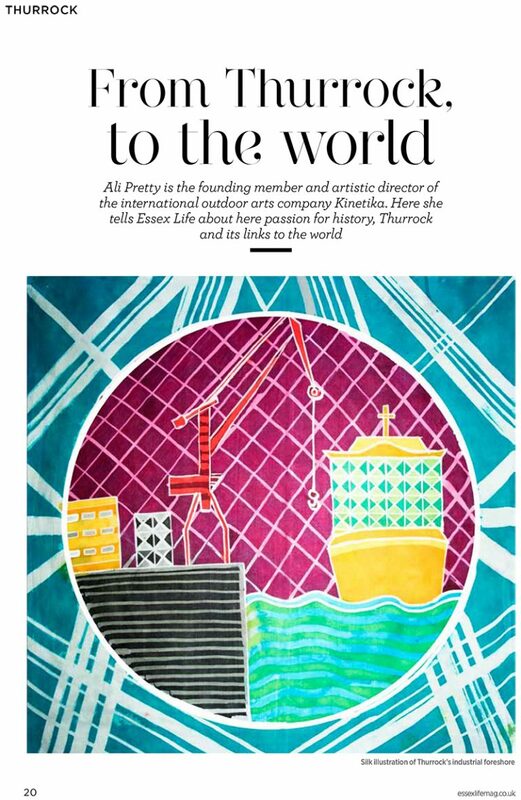 Fantastic feature now live where Ali discusses with Essex Life her passion for history, Thurrock and its links to the world and how this all ties in with the current Silk River project. 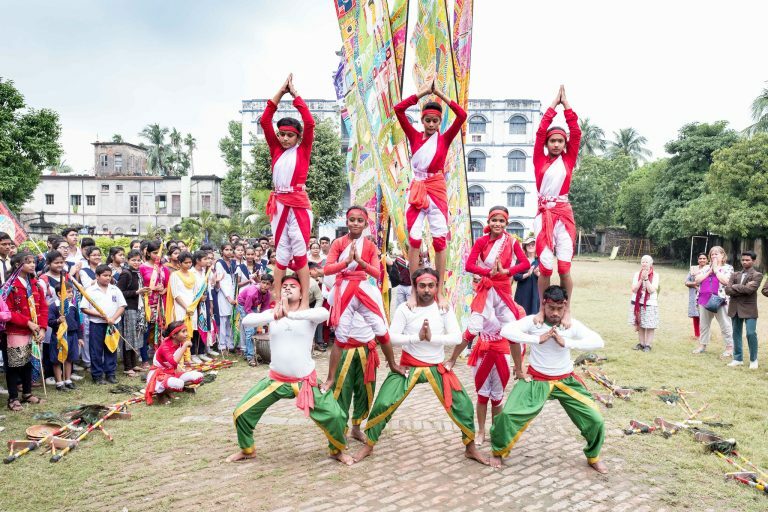 A week of workshops will kick off the Silk River project in the UK, collaborating with the Government of West Bengal and UNESCO Rural Craft & Cultural Hubs (RCCH).